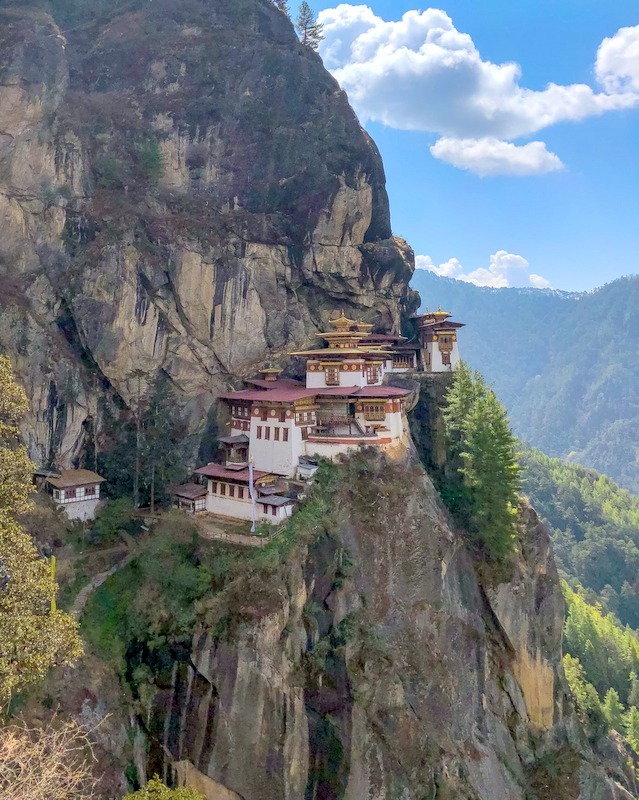 Bhutan is a Buddhist kingdom in the Eastern Himalayas, landlocked between India and China. The country is slightly smaller than the Netherlands, with a population in 2016 of about 800.000, roughly the same as the city of Amsterdam! It was only in 1974 that the isolated country opened its borders to foreigners. 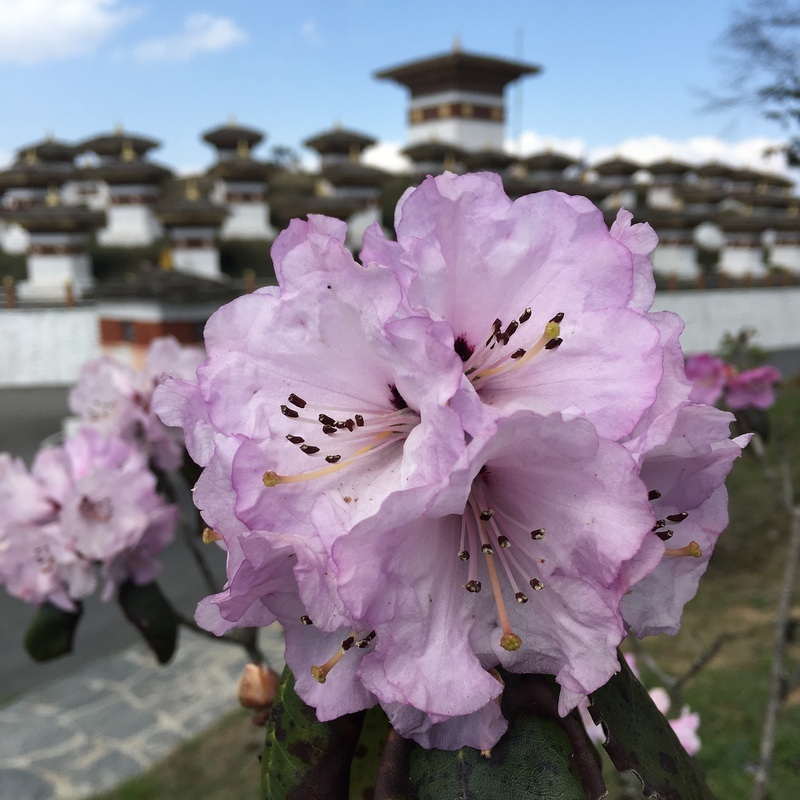 In that year 287 tourists visited Bhutan, a number that increased to almost 180.000 in 2016. Compare that with the 15.5 million tourists visiting the Netherlands in 2016! 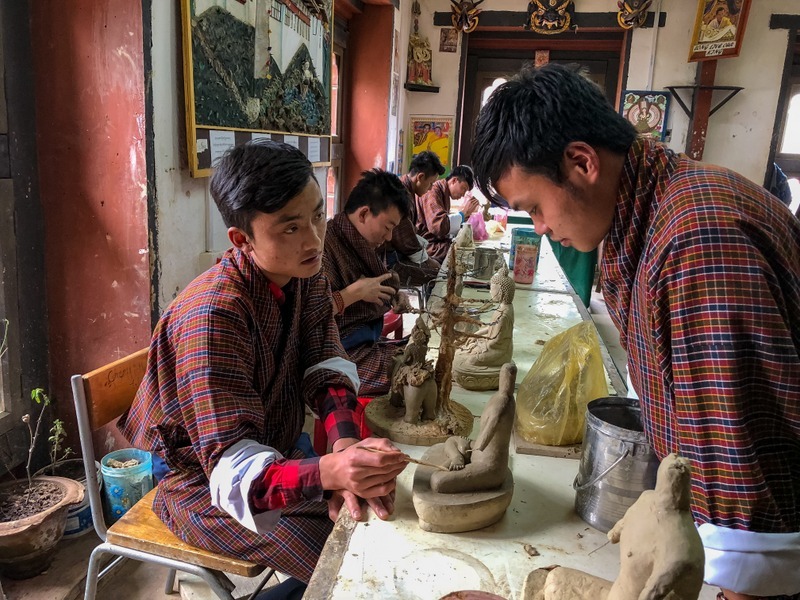 The Bhutanese government wants to preserve the traditional culture and has decided to limit the tourism, by making it expensive. Tourists have to spend 200-250 USD daily, depending on the season. But it was worth it! 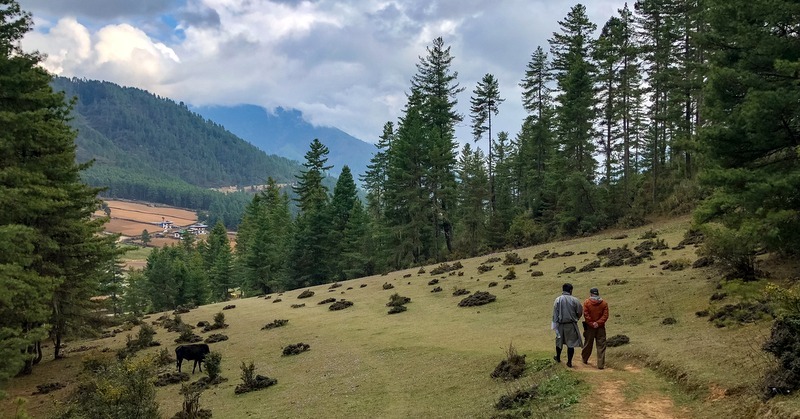 Before I start my travelogue, here is a Google Map of Bhutan in which I have indicated the places where we have stayed overnight (A – H) and some of the highlights of the trip (red markers). When you click on a marker, you will see a picture. The map can be enlarged and you can zoom in and out. 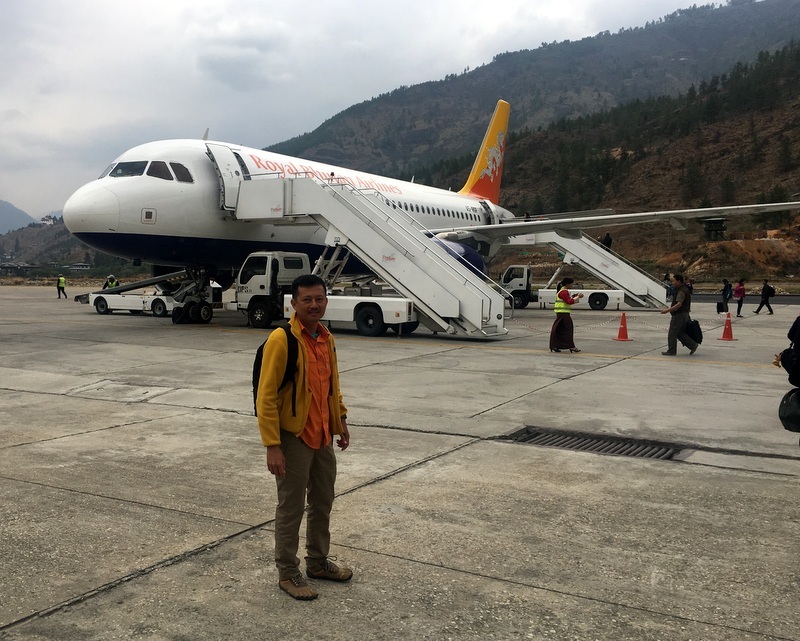 There are no direct flights from Kuala Lumpur to Bhutan, first we took a MAS flight to Bangkok, stayed overnight near the airport and early the next morning we departed with Druk Air for Paro, the international airport of Bhutan. The descent to the airport was quite spectacular. Because the terrain is so mountainous, the plane can not approach in a straight line. Aric took pictures during the descent and nowadays smartphones can record GPS data, even inside the plane! 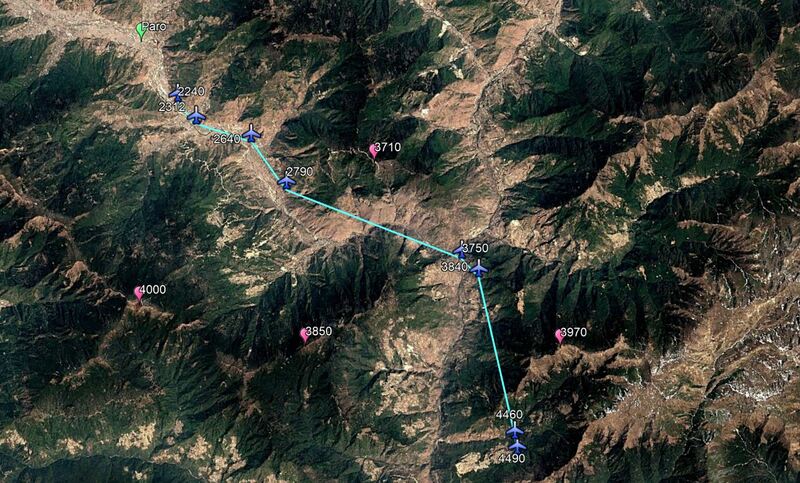 The GE screenshot shows the altitude of the plane and the surrounding mountains. 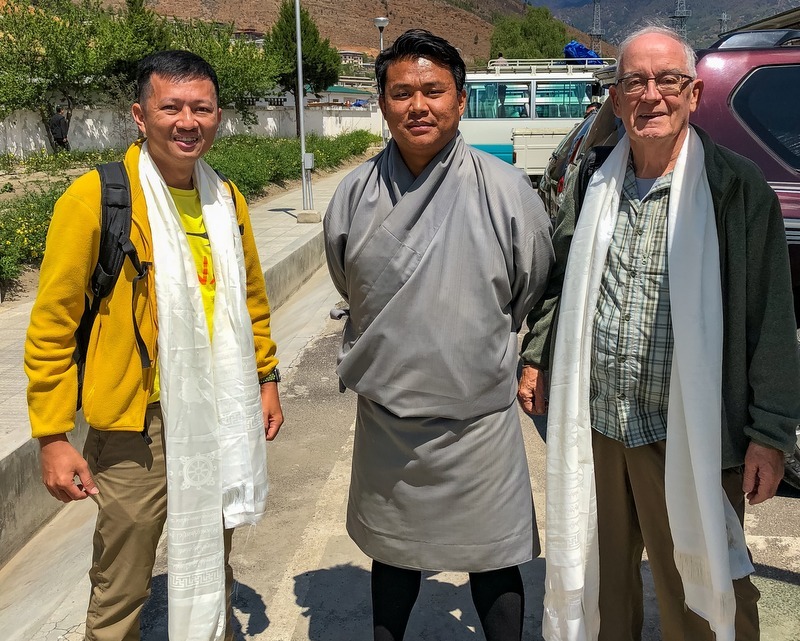 At the airport we were welcomed by Ram, the owner of Book Bhutan Tour, and Tenzin, our guide. We received as welcome gift a khata, a silk shawl, decorated with the Ashtamangala , the Eight Auspicious Signs. Tenzin, our guide, is wearing the traditional Bhutanese dress for men, the gho. 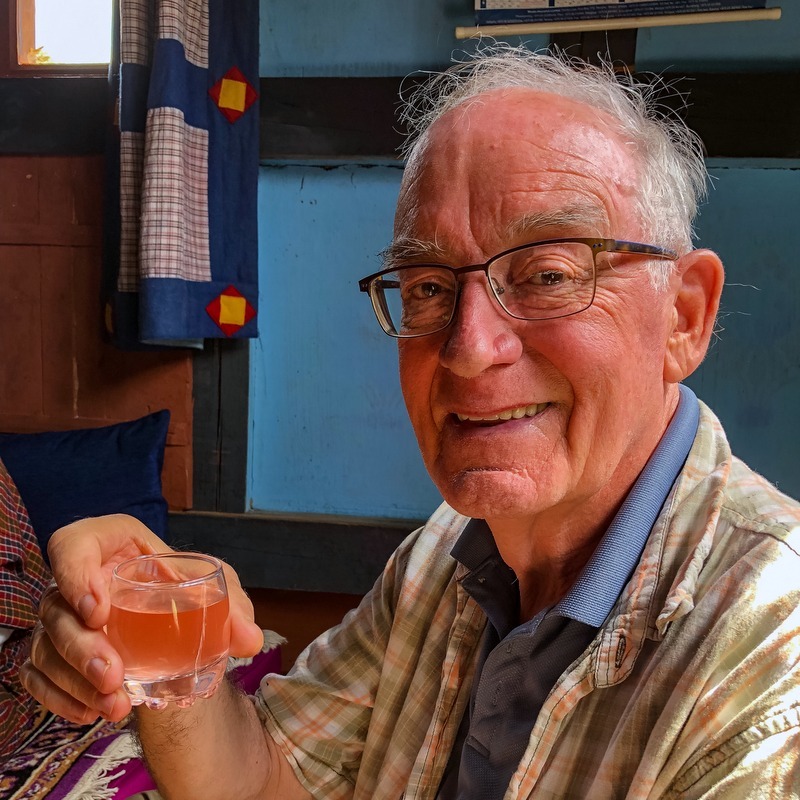 After a cup of coffee we drove to Thimphu, the capital of Bhutan, where we had our first Bhutanese food. 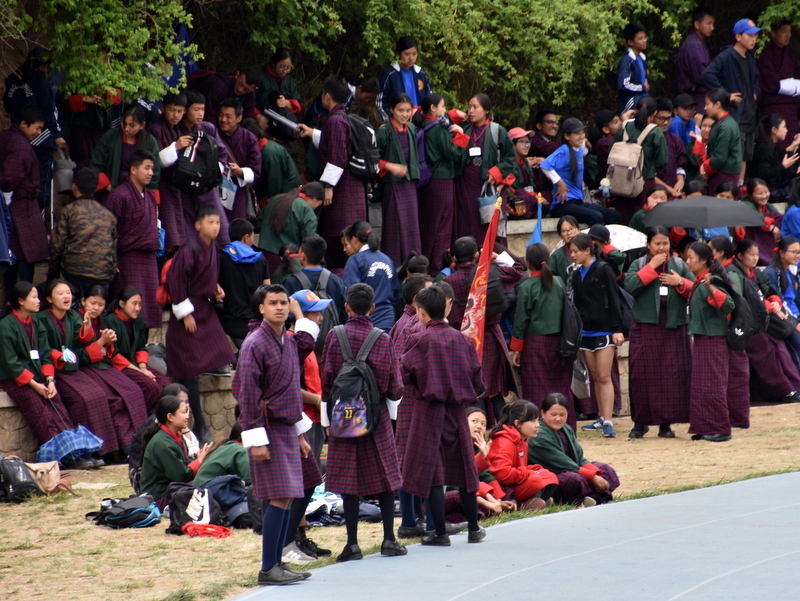 On the way to our hotel we passed a sports meet, where students were competing in various activities. Fascinating to see how the spectators were all dressed in traditional garb, the boys in their gho with black knee stockings and the girls in their kira. Our room in the Jumolhari Hotel was comfortable. As we had got up at 4am, we took a short rest. 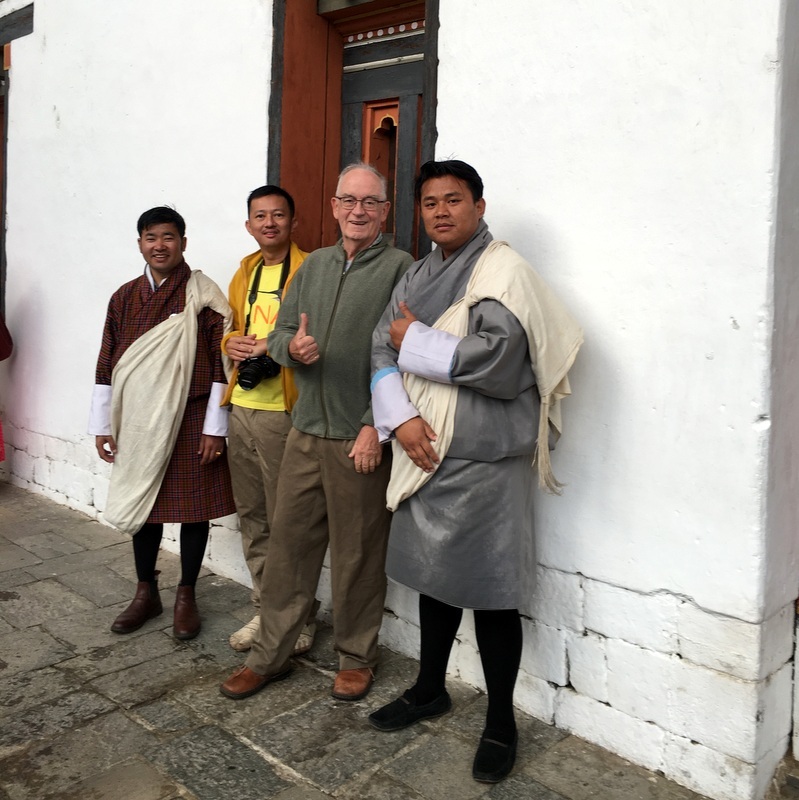 But not for long, we were going to visit our first Dzong! 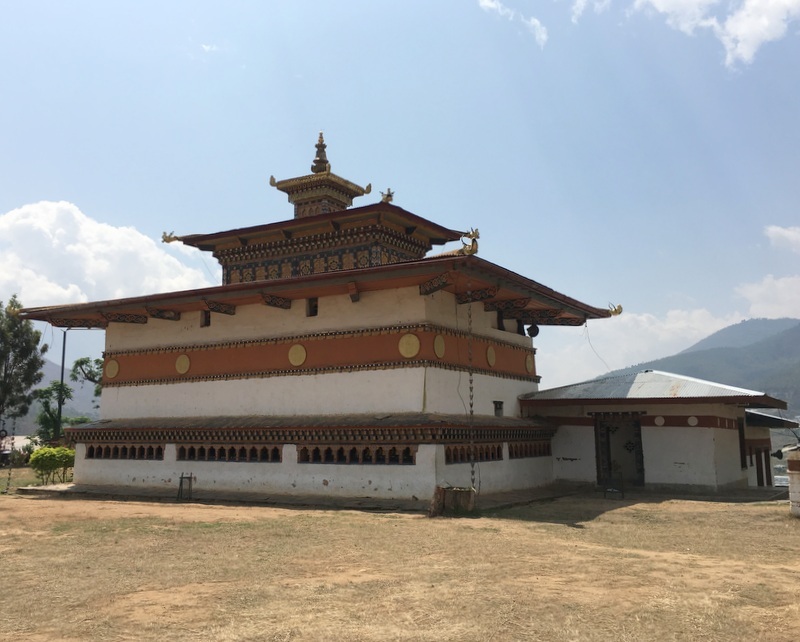 A Dzong is a fortress, often built on a hill top, dominating a town. 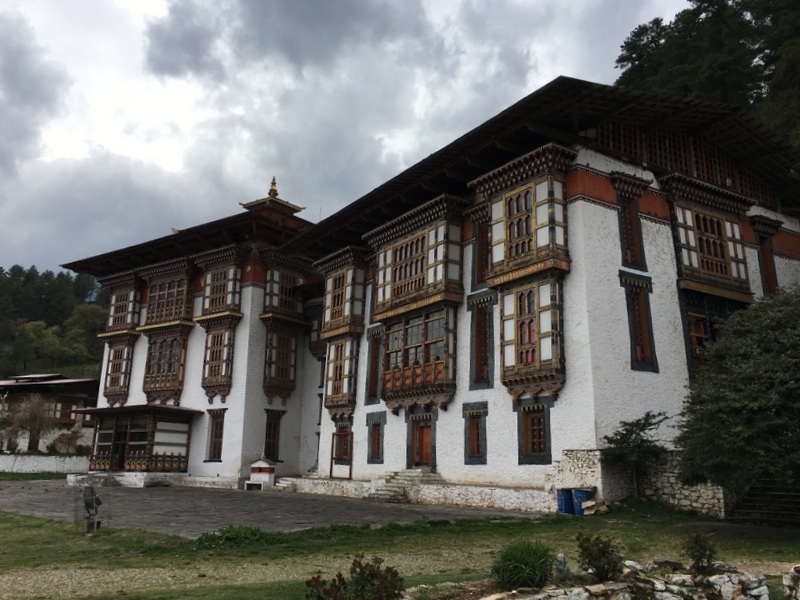 Half of a dzong houses administrative offices, the other half is occupied by the monastic body, monks quarters, chapels etc. Many of them have their origins in the 17th century, when Zhabdrung Rinpoche unified Bhutan as a nation-state. 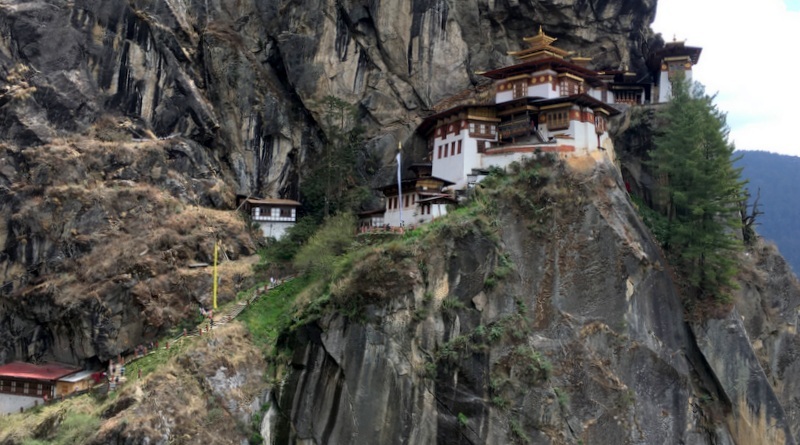 These spectacular fortresses are one of the main reasons to visit Bhutan. 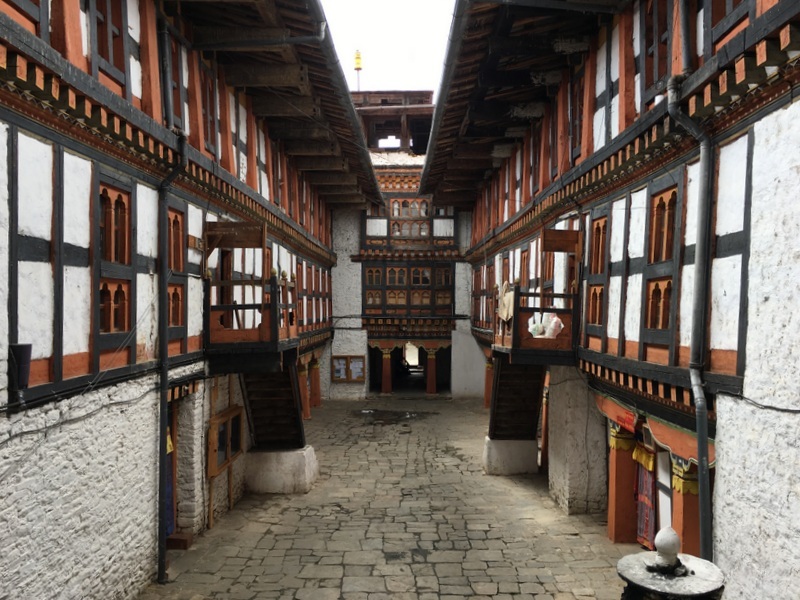 Here is the Tashichho Dzong in Thimphu. 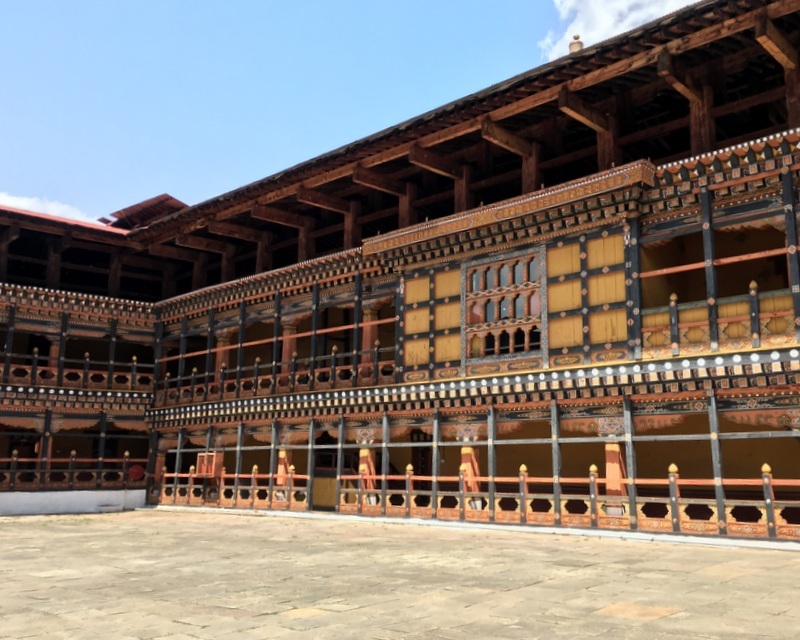 Built in 1641, it has been the seat of Bhutan’s government since 1968. 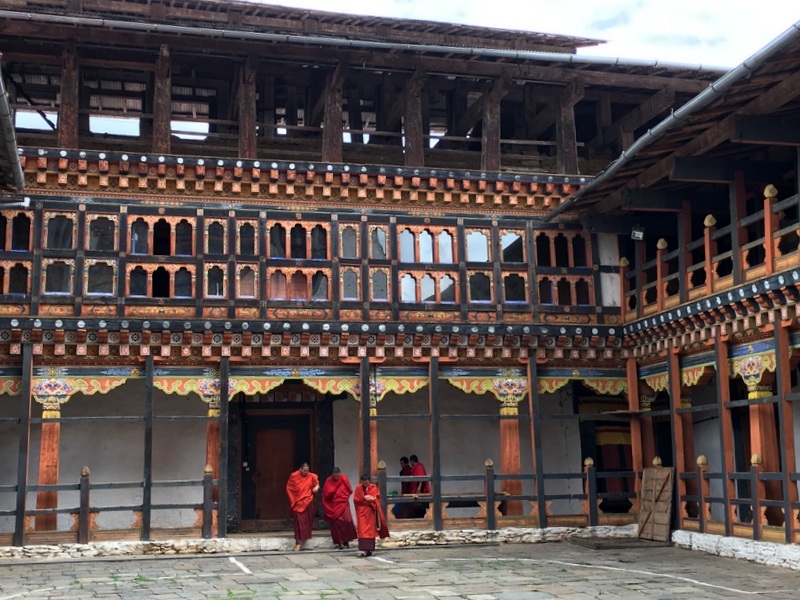 Because government offices are housed in the dzong, access is only allowed after working hours and there is a dress code. 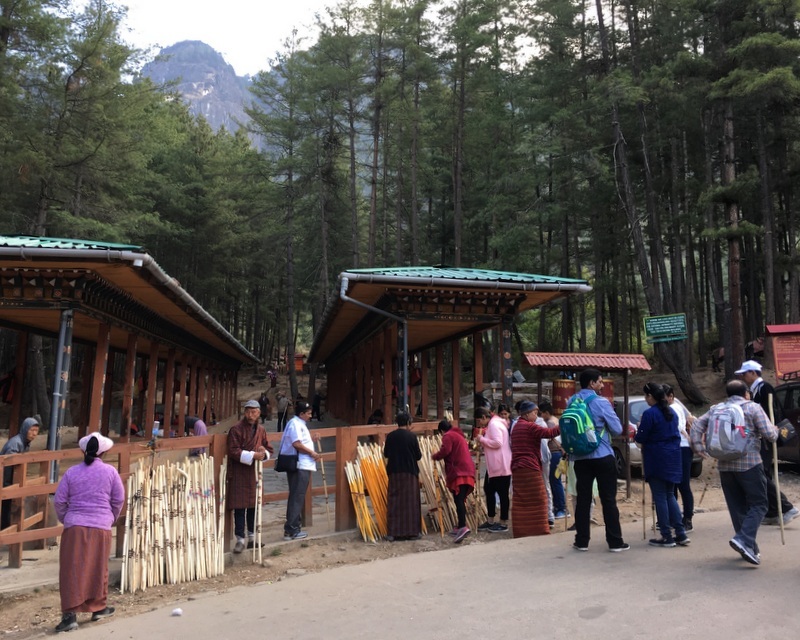 Bhutanese men have to wear a ceremonial white scarf, and tourists should not wear t-shirts, shorts or sandals. When we arrived, it was raining, they were just lowering the flag. After a while the rain stopped and we could enter the courtyard. 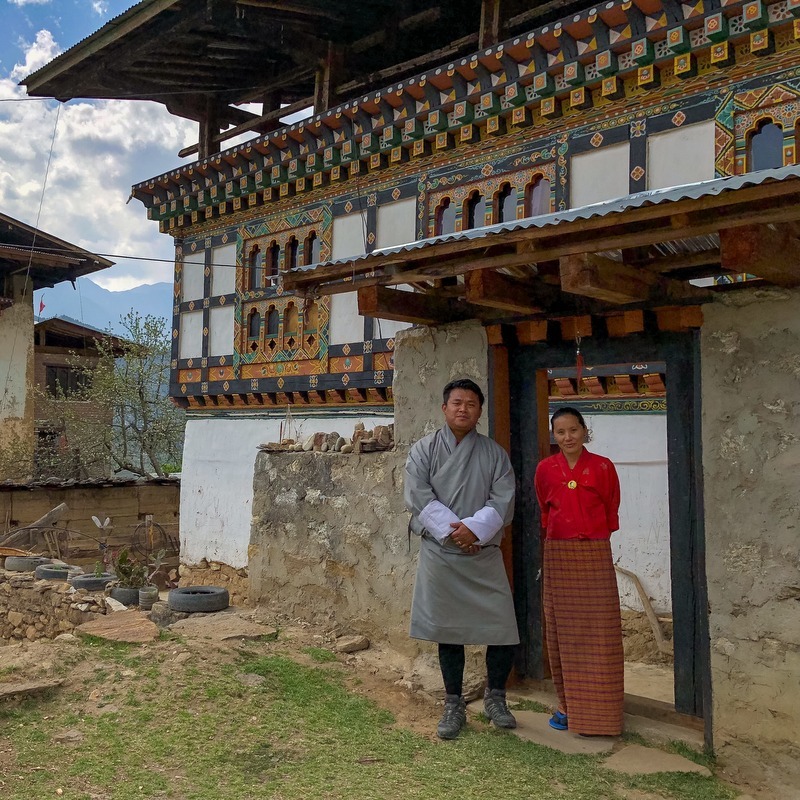 It was our first dzong, so we took numerous pictures. 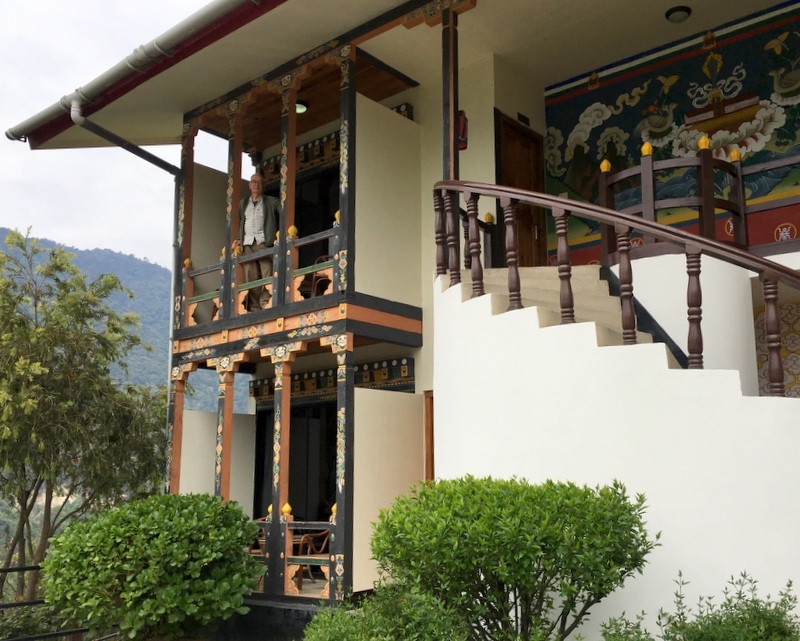 Bhutanese architecture is beautiful, very traditional and decorative. We spent this day in Thimphu. 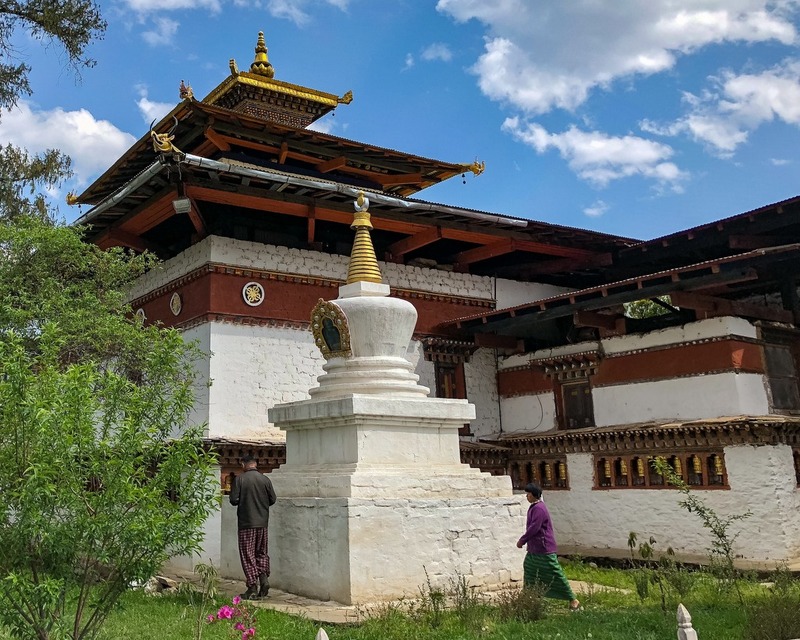 First we visited the Memorial Chorten , built in 1974 in memory of Jigme Dorji Wangchuck, the 3rd Dragon King, who died in 1972. 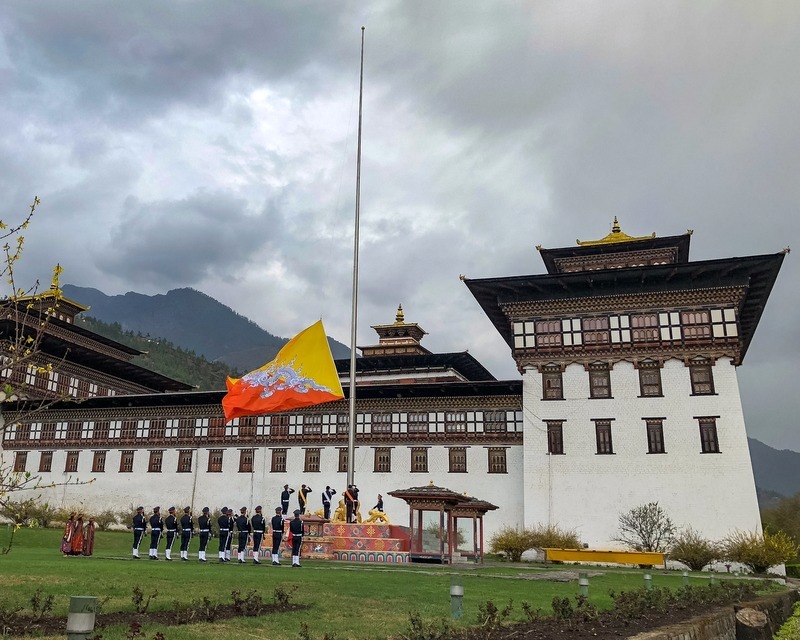 There is a lot of respect and love for the royal family in Bhutan, which may explain that daily hundreds of locals visit the memorial for praying. 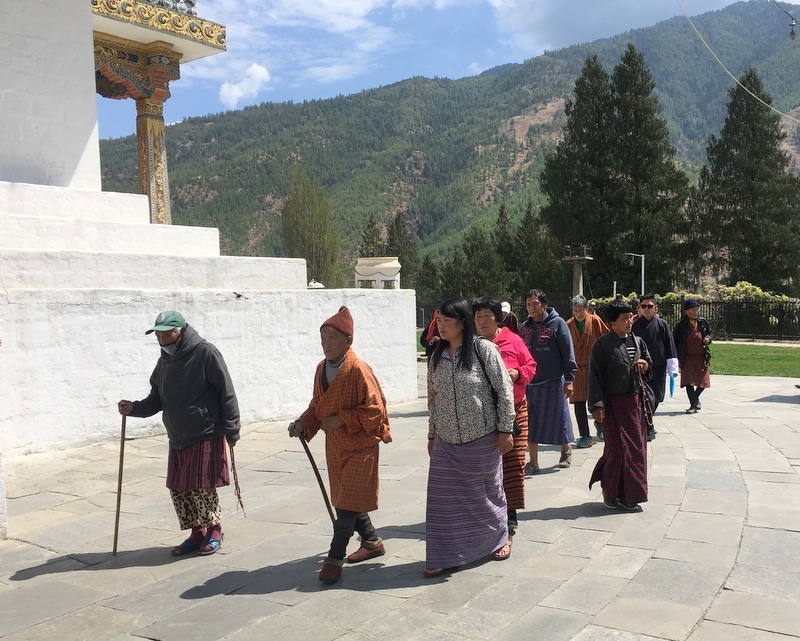 They walk many times around the chorten (stupa), always in clockwise direction. 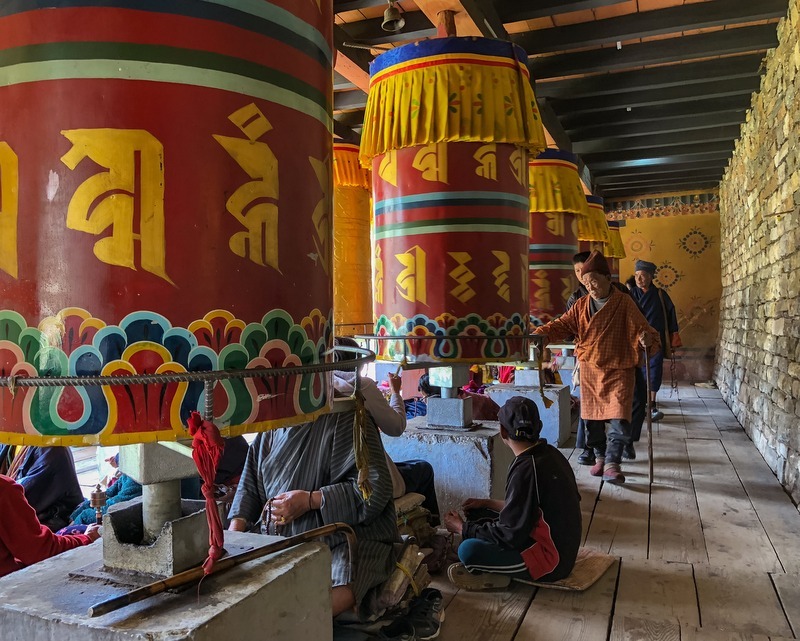 Or they go to the prayer wheels and turn them around and around. Old ladies sit down near those wheels and keep turning them. Fascinating. Next we went to the Great Buddha statue, one of the largest Buddha statues in the world, 52 m high. Construction started in 2006 and was completed in 2015, only a few years ago. 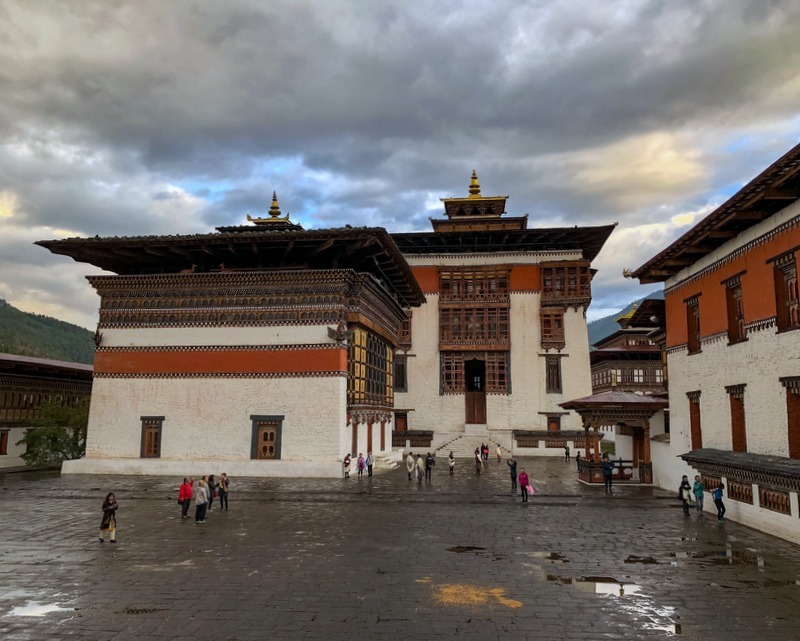 It is quite impressive, although there has been criticism that it is megalomaniac and doesn’t fit in the Bhutanese culture. 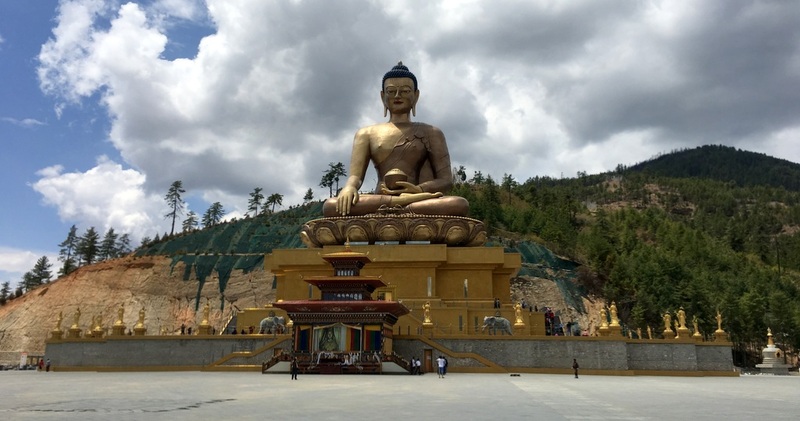 The Buddha is overlooking Thimphu and can be seen from far away. Inside the statue are temples and halls, containing ten thousands of small bronze Buddha statues. Back in our hotel, we had dinner. 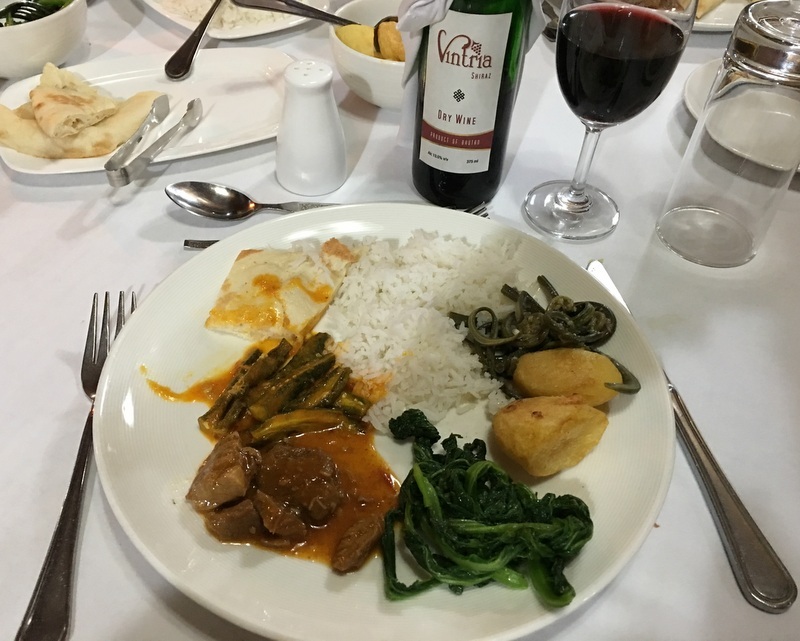 We had several nice meals, but in general Bhutanese cuisine is not a reason to visit the country. 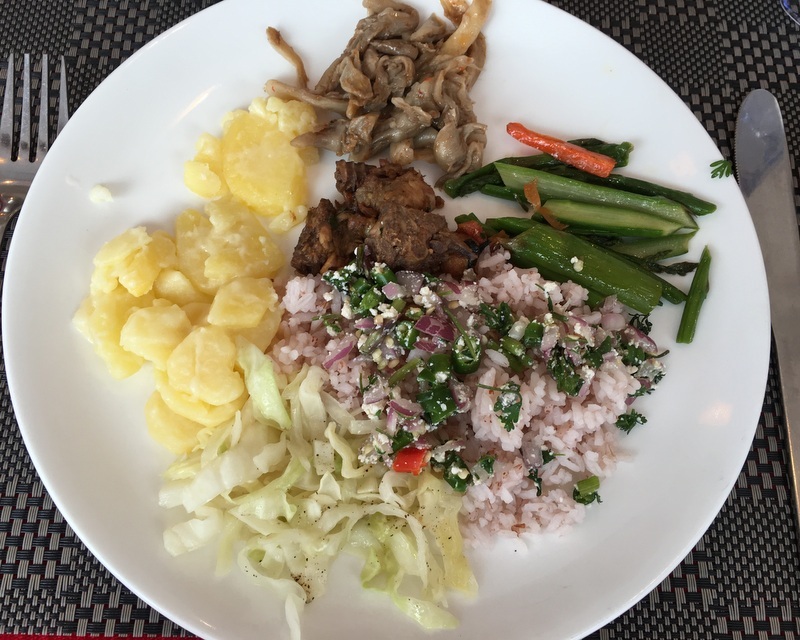 The red rice is tasty, many dishes are prepared with local cheese and can be very spicy. Not much variety. Also here a division in a governmental and a monastic half. A very impressive fortress. 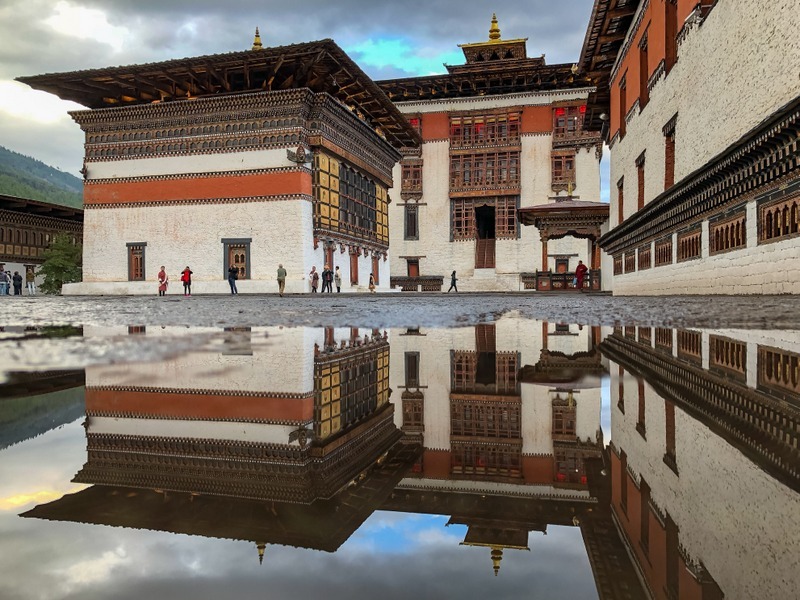 The dzong is a paradise for photographers. Here a small selection from the many pictures we took during our visit. 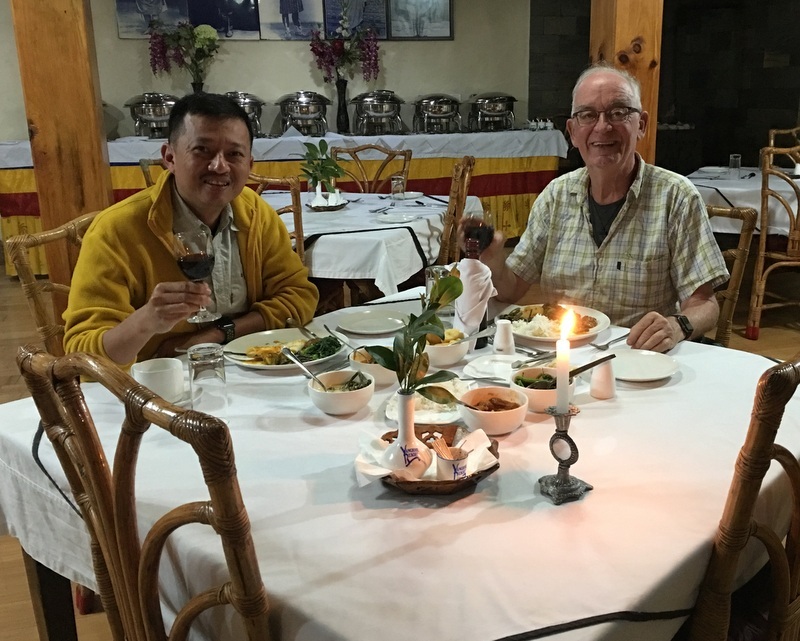 We stayed overnight in the nice Yangkhil resort, celebrating a long, tiring day with a bottle of Bhutanese wine. 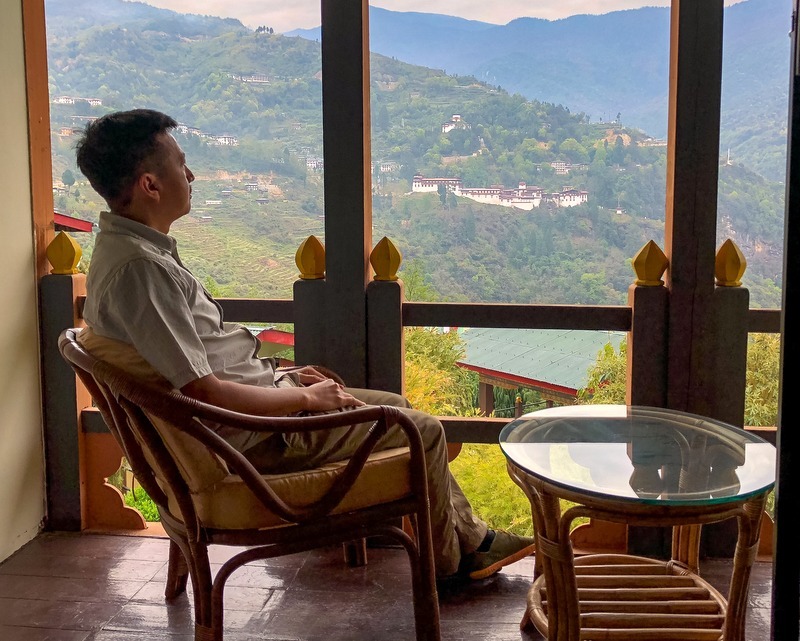 Our room had a balcony with a view of the Trongsa Dzong. After breakfast we continued our trip . Also here they were working on the “highway”, widening it. 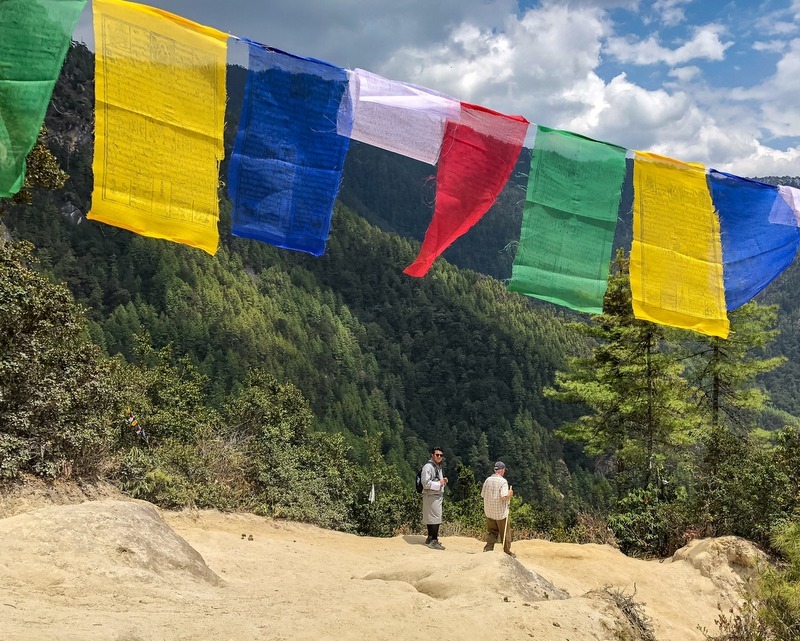 We stopped for a while at the Yutong La pass, marked by a chorten and a sea of prayer flags. At an altitude of 3425 m, you feel out of breath easily! 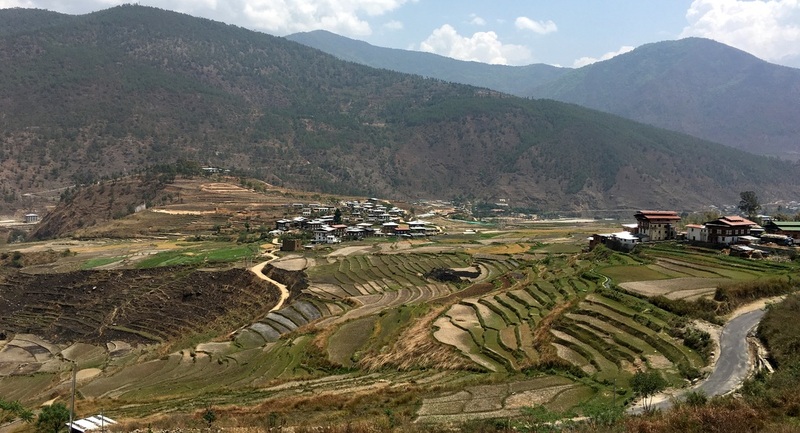 After the pass we descended into the Bumthang Valley , the religious heartland of Bhutan. 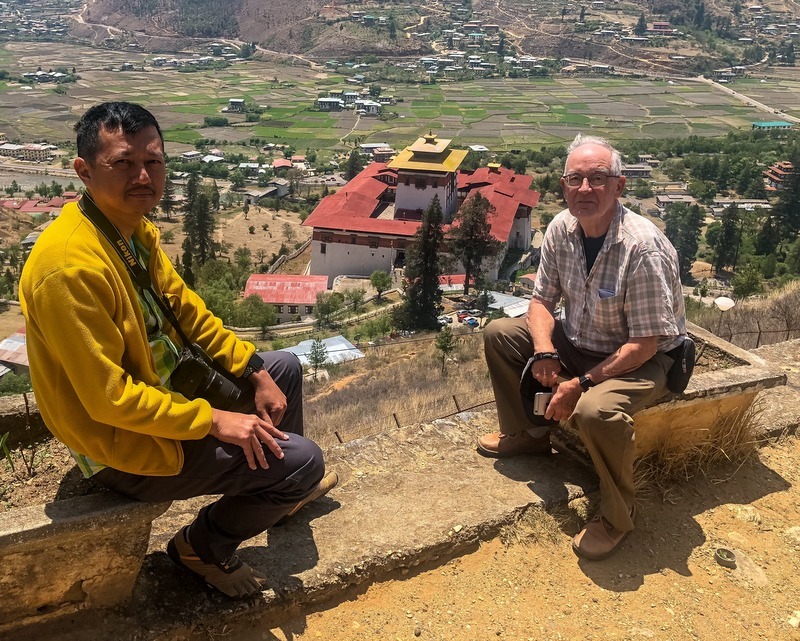 First we visited the Jakar Dzong, founded as a monastery by the great-grandfather of the Zhabdrung and in 1667 extended as a dzong. Impressive, large building. Walking back to our car we met a group of young schoolboys going home, dressed in their gho uniform. They were friendly and could speak English quite well. 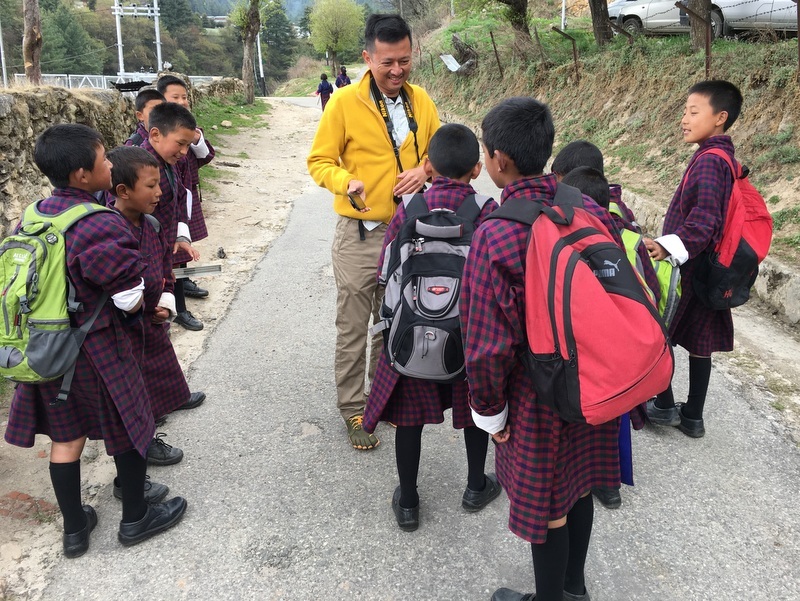 It is educational policy in Bhutan to teach English already in primary school. After lunch we visited two holy places, each with an interesting history. 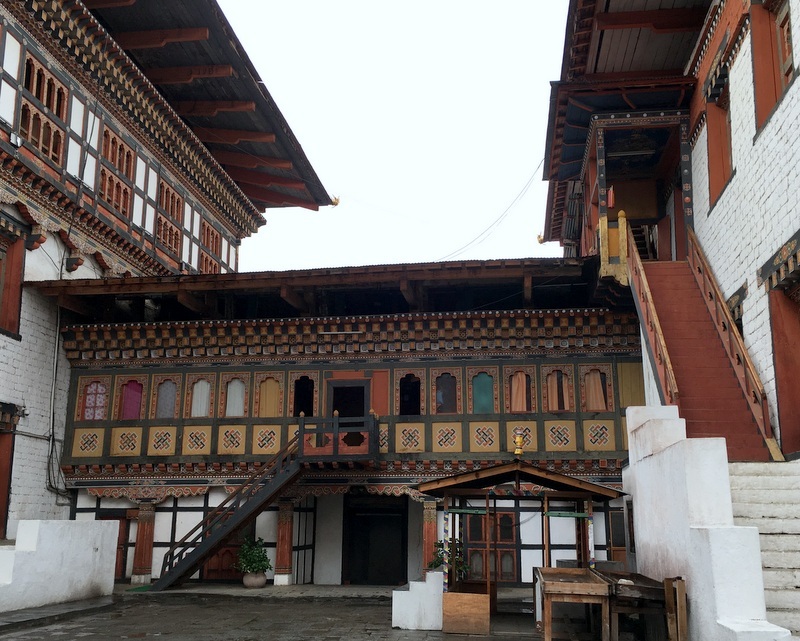 The first one is the Jambay Lhakhang. According to legend, it is one of the 108 temples, built by a Tibetan King in 659 on a single day, to pin down a female demon. 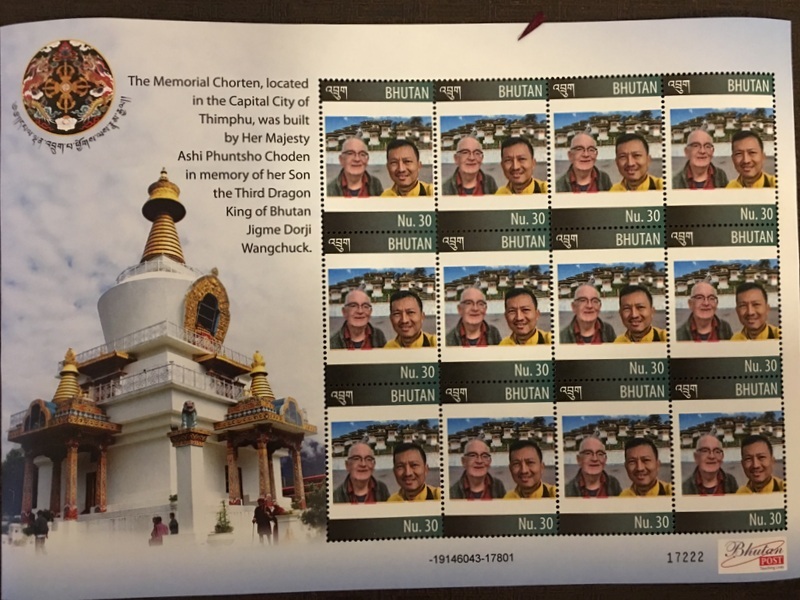 The temples were constructed on her body parts that spread across Tibet and Bhutan. 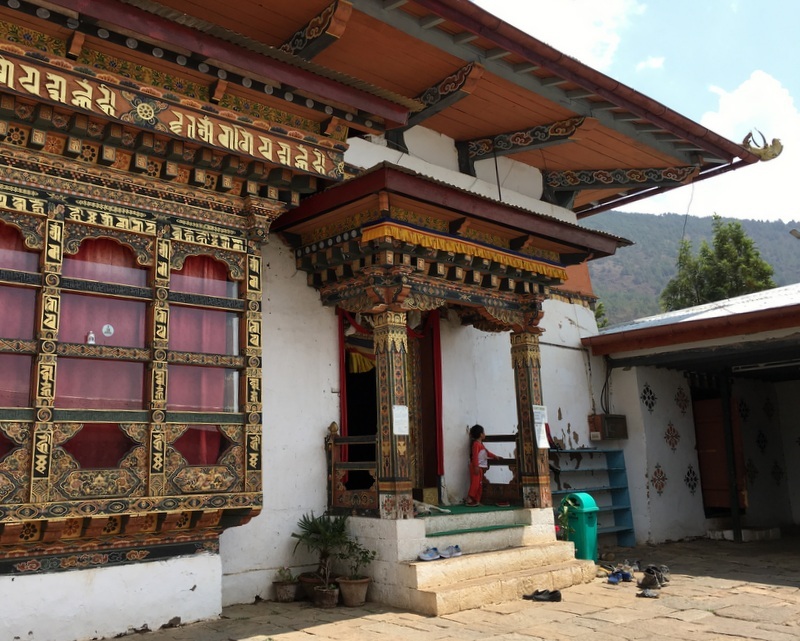 In Bhutan two of the temples still exist, the other one is in Paro (see later). Of course they have been repaired and rebuilt several times. Looking at the many devotees visiting the temple, it is still a very holy place. On the temple grounds we noticed this large collection of miniature stupas. 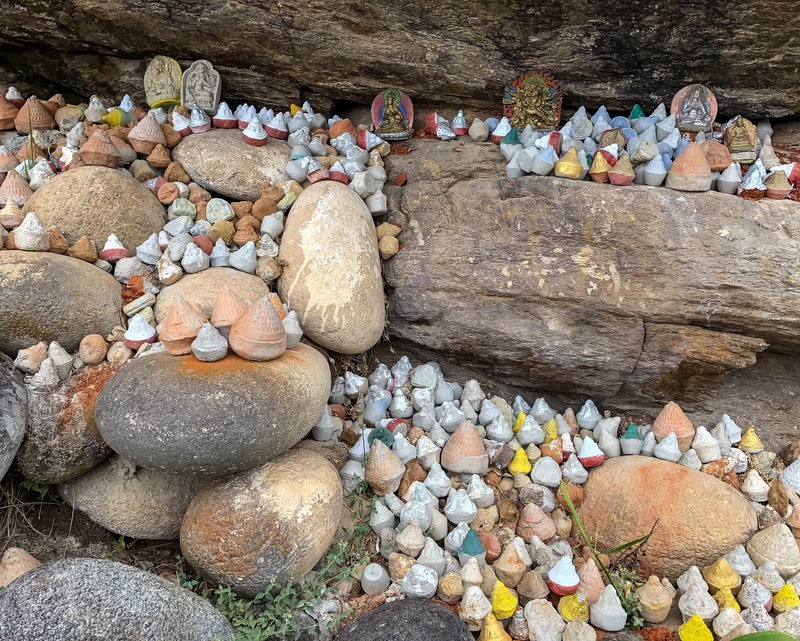 They are placed here by devotees who hope that it will add to their karma. 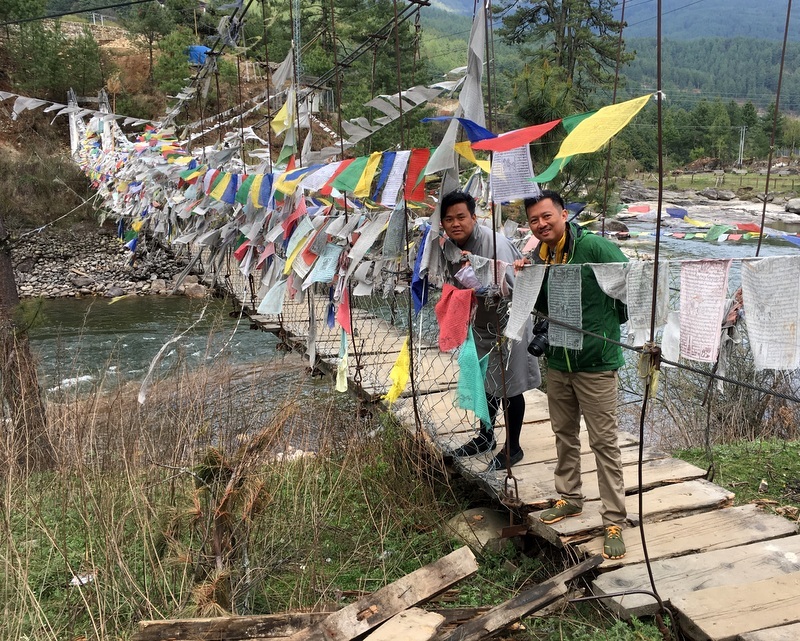 And near the temples there was a hanging bridge decorated with numerous prayer flags. 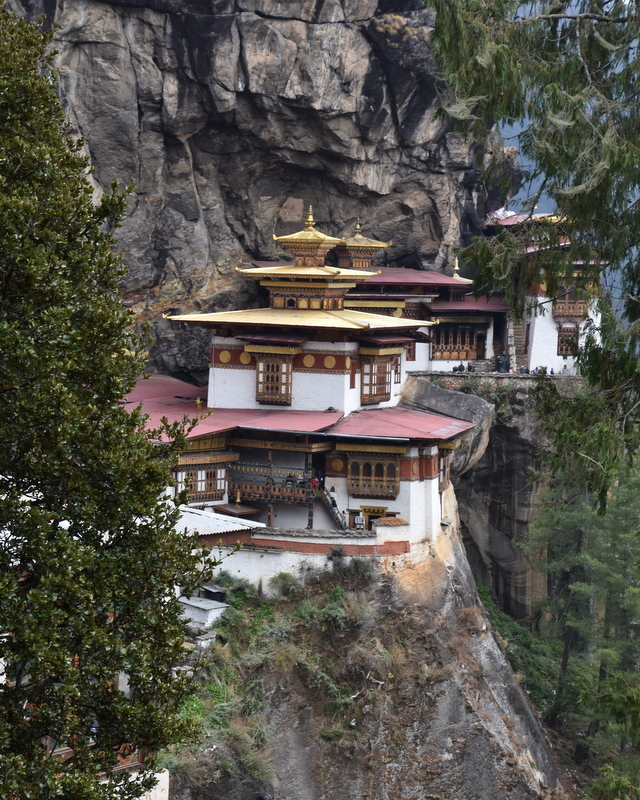 Bhutan is a deeply religious country. We were getting tired, it was time to go to our guesthouse. The Swiss Guesthouse to be precise and indeed, it felt a bit like Switzerland..:-) . 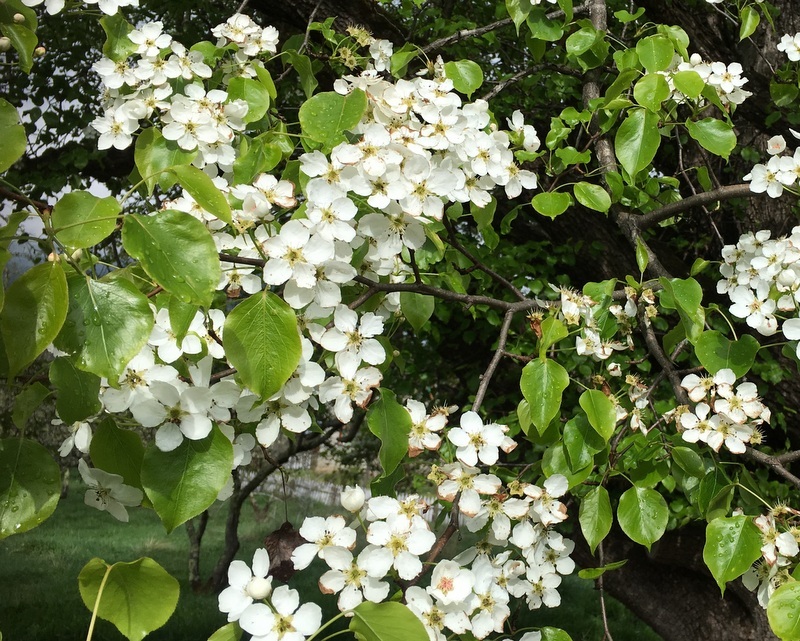 With an apple orchard, a wood stove in our (spacious) room and a more or less Western style dinner. 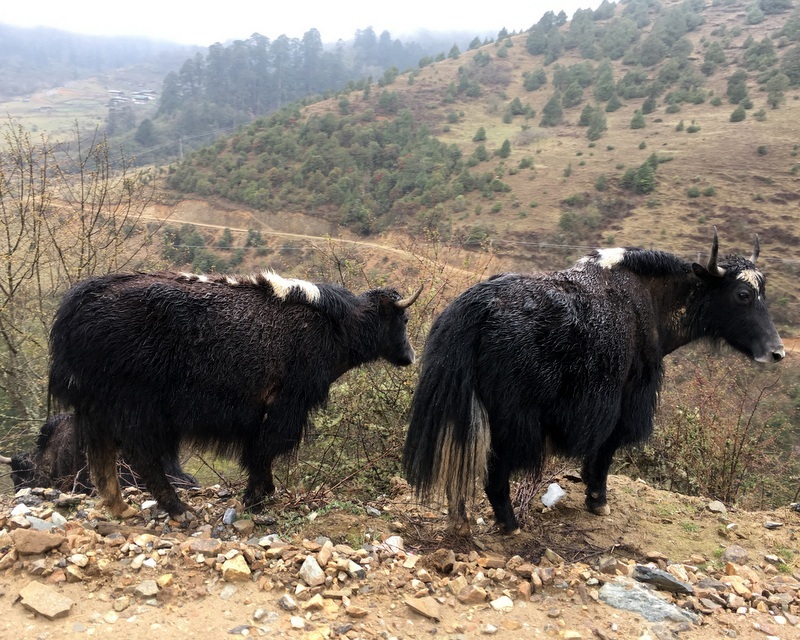 At high altitudes, there are no longer cows but yaks. And of course there were rhododendrons. 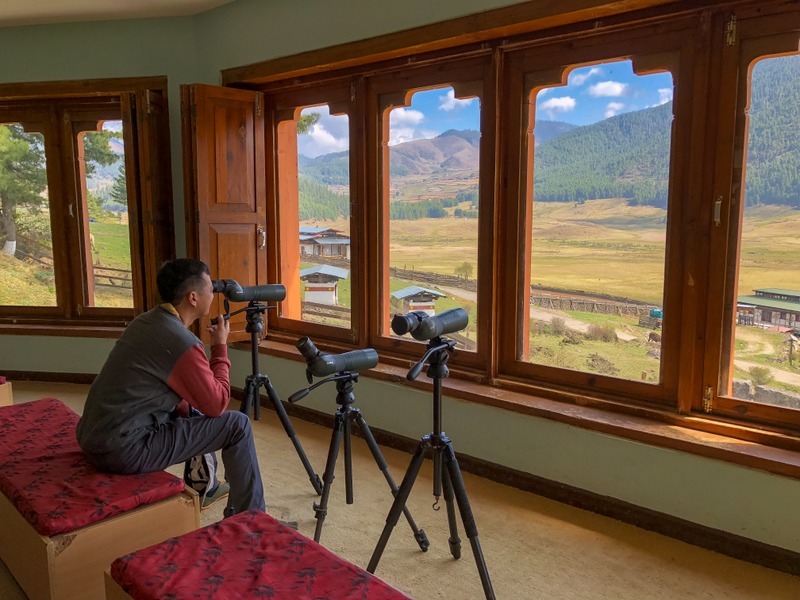 Destination for the day was the Dewachen hotel in the Gangteng Valley, a vast U-shaped glacial valley at an altitude of ~ 3000 m. During the winter months the globally threatened Black-necked Cranes roost here. 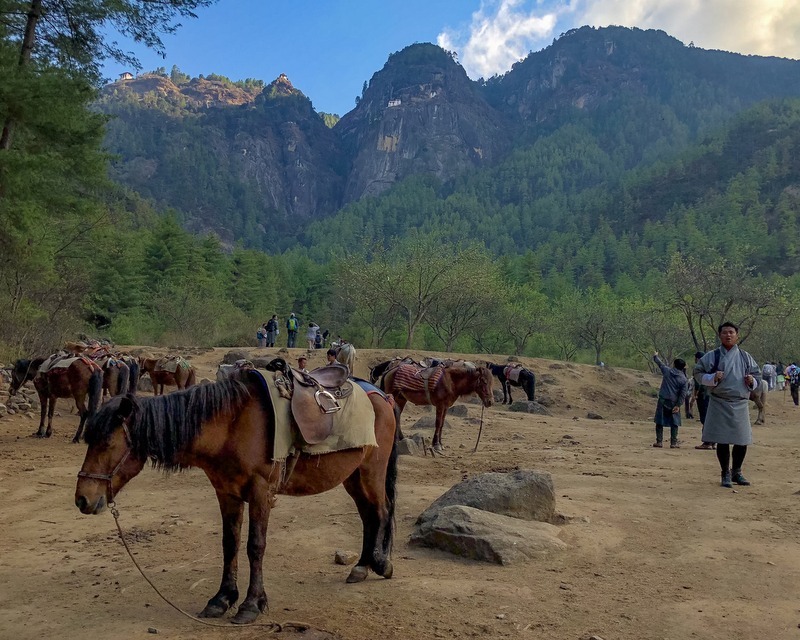 It is a beautiful valley and our guide Tenzin suggested that we should hike a 4 km nature trail to the hotel. It was a pleasant walk. 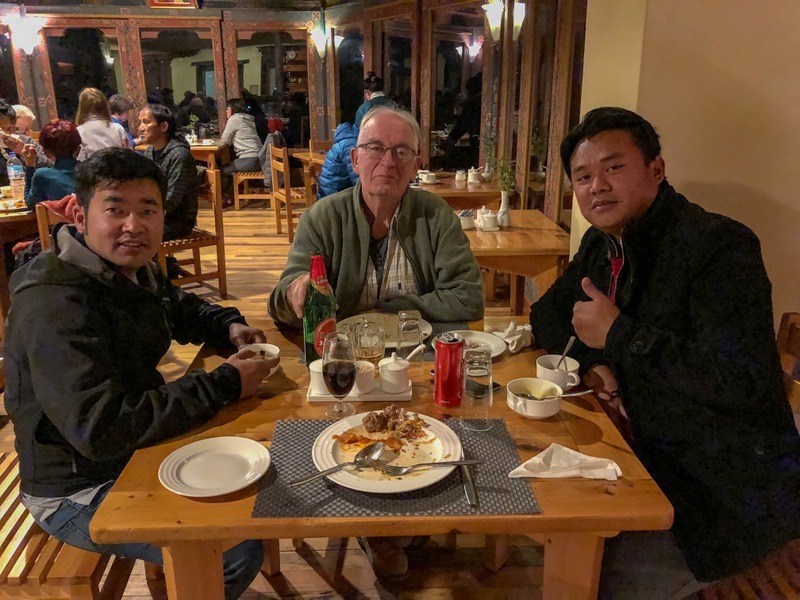 The last few days we had been often the only guests in the restaurants and guesthouses. Here in the Dewachen Hotel there was quite a crowd. We had a beautiful room with a view of the valley. 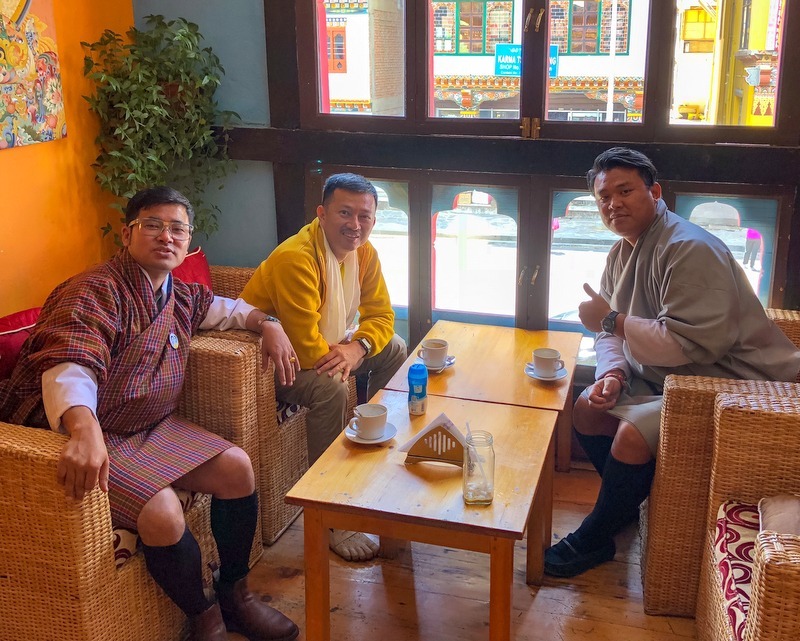 After our dinner Ram and Tenzing joined us for a while, dressed this time in “western” outfit…:-). Both are nice guys and became our friends easily. We passed a school and of course I had to take a look. There was a sports meet going on, so we could have a look inside. Nice to teach arithmetic this way! 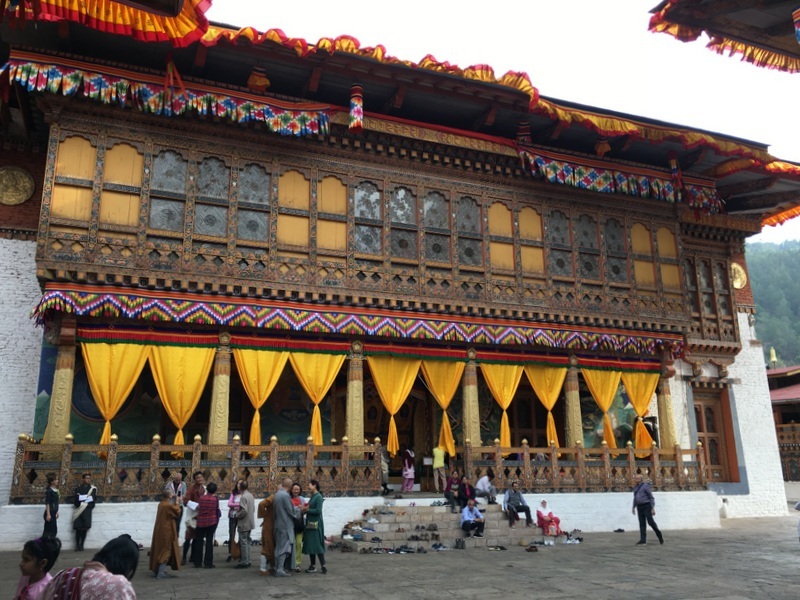 The Gangtey Monastery is one of the most important centers of Bhutanese Buddhism. Established in 1613, but of course several times rebuilt and restored, last in 2002-2008. 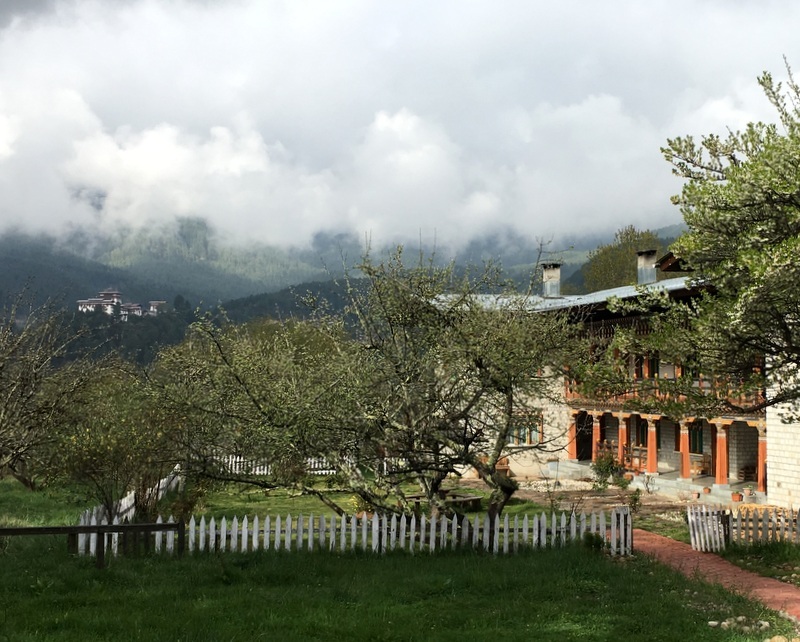 This is a monastery, not a dzong. 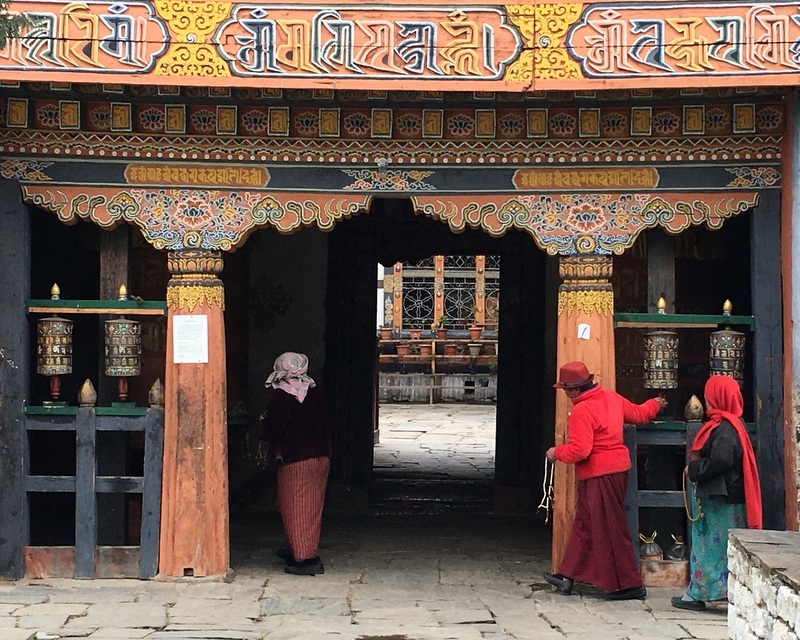 There are prayer halls, the monks have their rooms, no government offices here. 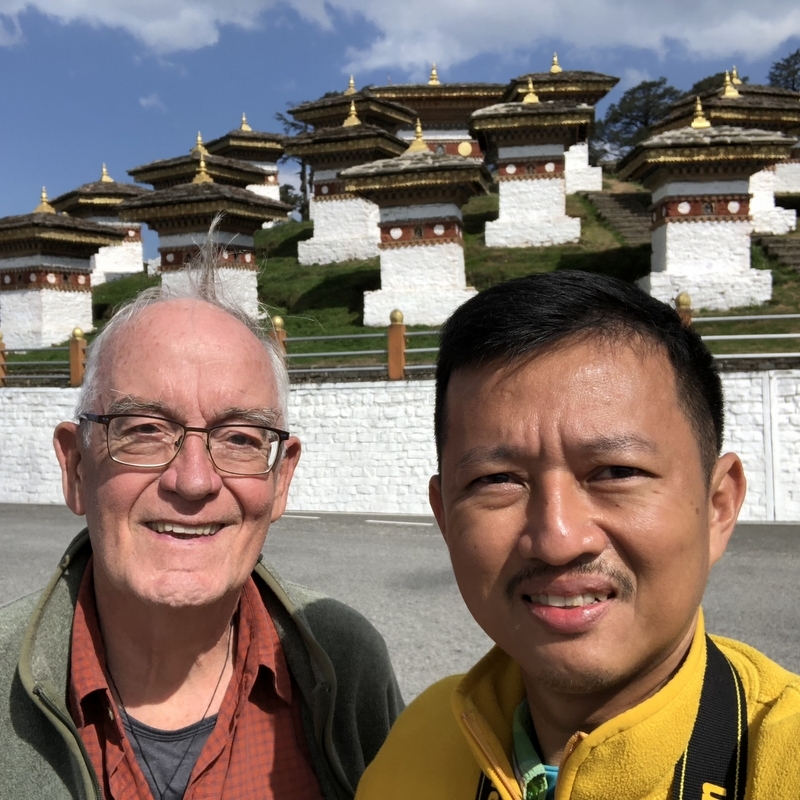 In the late afternoon we reached the Punakha Dzong. Altitude 1230 m, 2100 m lower! 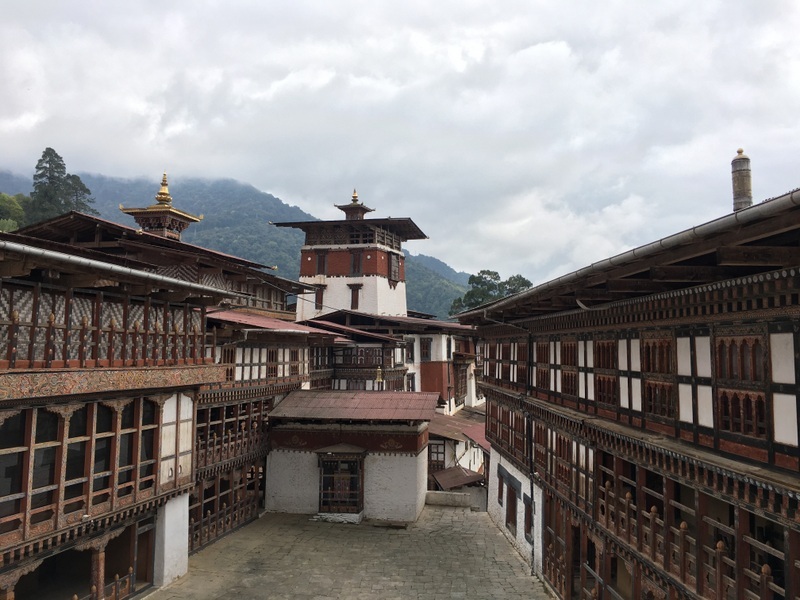 Constructed by the Zhabdrung Rinpoche in 1637–38, it is the second oldest and second largest dzong in Bhutan and one of its most majestic structures. 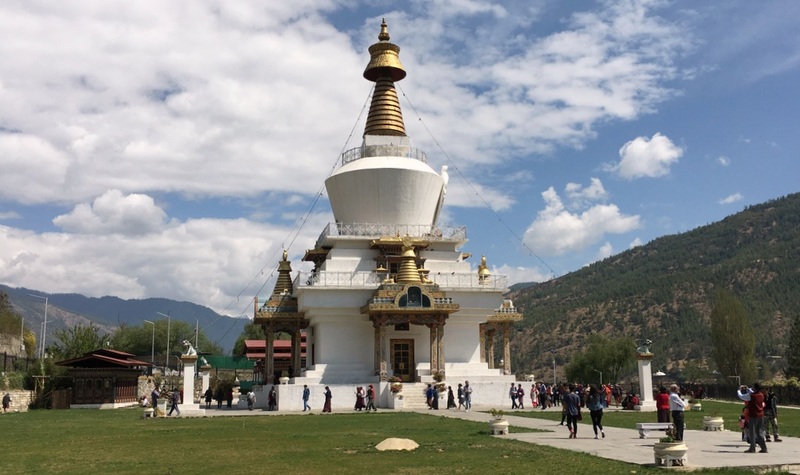 Quite accessible, compared with Trongsa and Bumthang, not surprisingly there were relatively many tourists here. The dzong closes at 5pm, we could not really visit in detail. 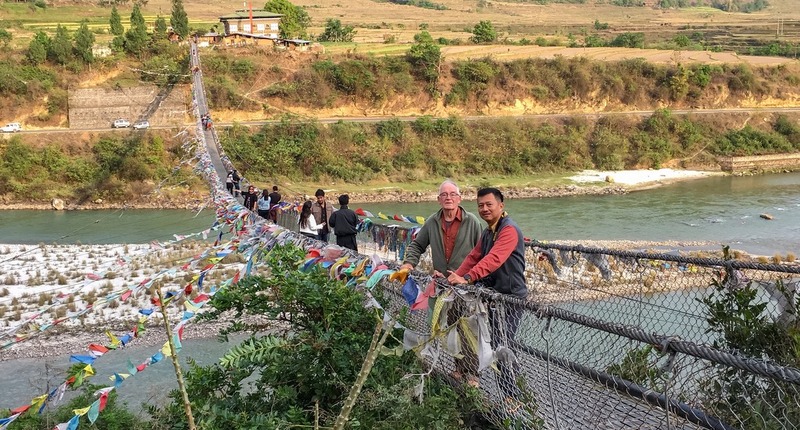 Before going to our hotel we visited the longest suspension bridge of Bhutan. 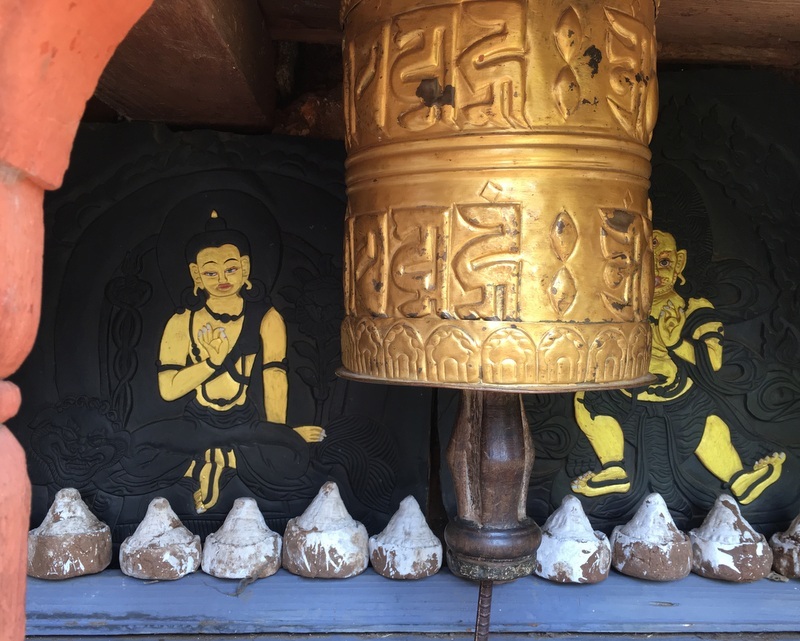 Modern design, traditionally decorated with prayer flags. 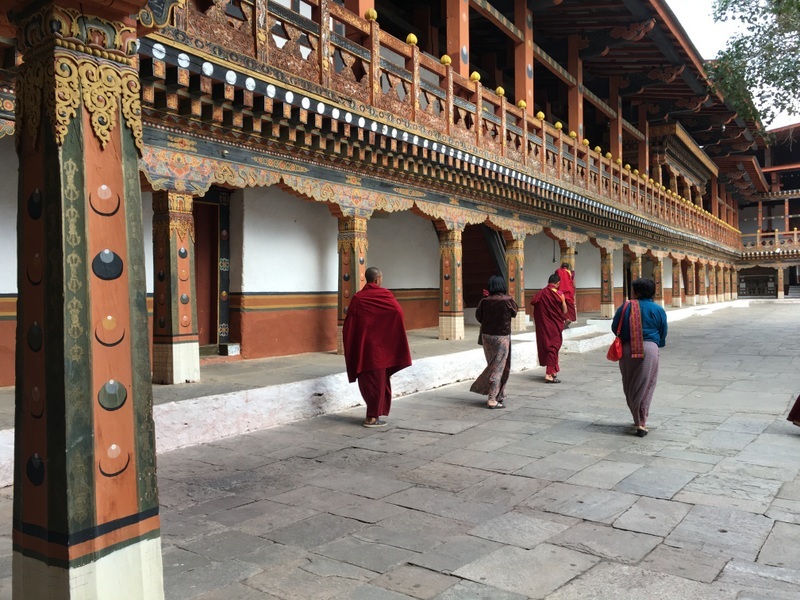 After breakfast we visited Chimi Lhakhang, a monastery near Punakha, with an interesting history. Built in 1499, it was the monastery where the “Divine Madman” lived. 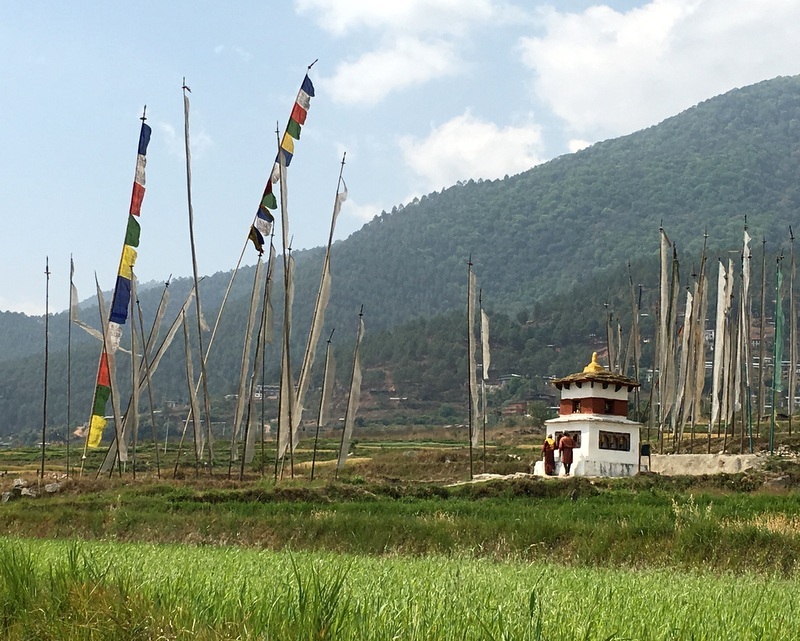 From the Wikipedia link: “Some of his most famous performances include urinating on sacred, thankhas, stripping down naked or offering his testicles to a famous Lama.” It is a nice walk through the padi fields to the modest monastery. 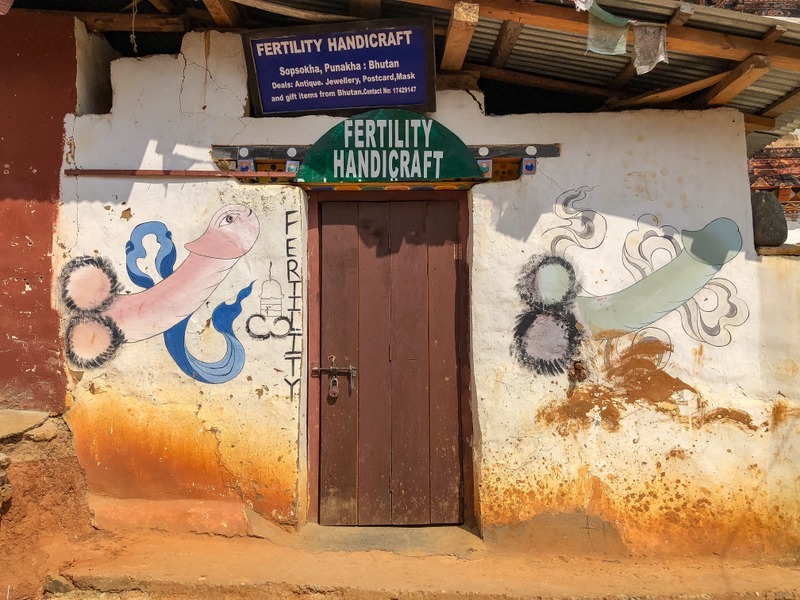 The tradition to decorate houses with paintings of erect penises originates from the Divine Madman. Nowadays the government discourages this tradition, but in the countryside we had still seen several (see picture above). 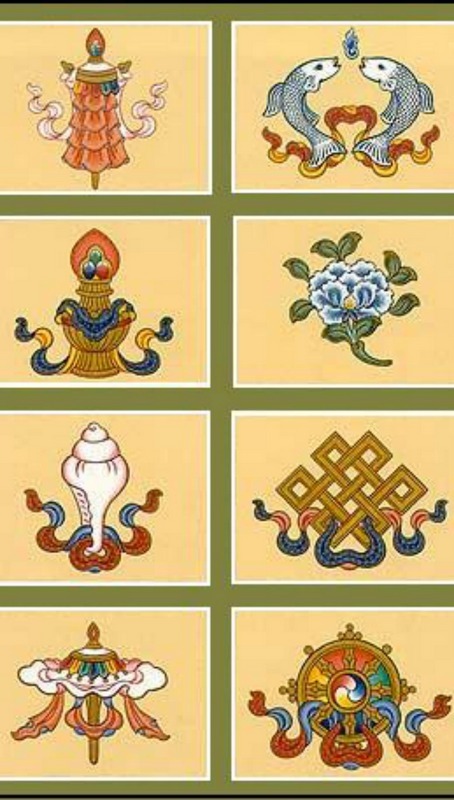 They are not fertility symbols but serve to protect against evil spirits and demons. But of course I joined the crowd in taking pictures. Here is a collage. Next stop was at the Royal Botanical Park, where that day the yearly Rhododendron festival took place. Quite a few visitors, mostly locals. 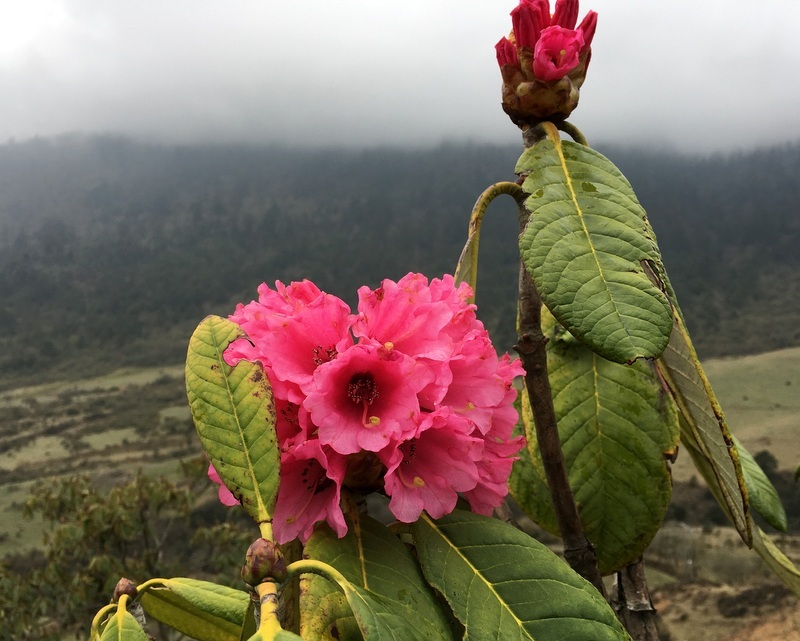 The rhododendron season was almost over, we had to search for nice specimens. Our last stop was at the Dochula mountain pass at 3100m. With clear skies you can see from here the big Himalaya mountains, but, although the weather was nice, the view was not clear. 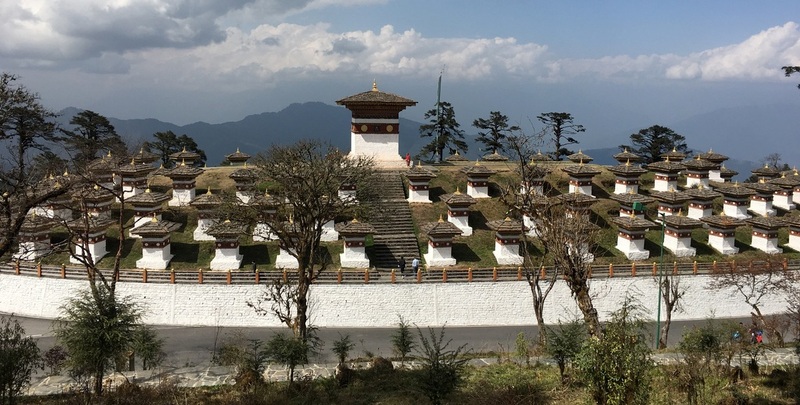 The 108 memorial chortens have been constructed in 2004, in honour of the Bhutanese soldiers who were killed in the December 2003 battle against Assamese insurgents from India. 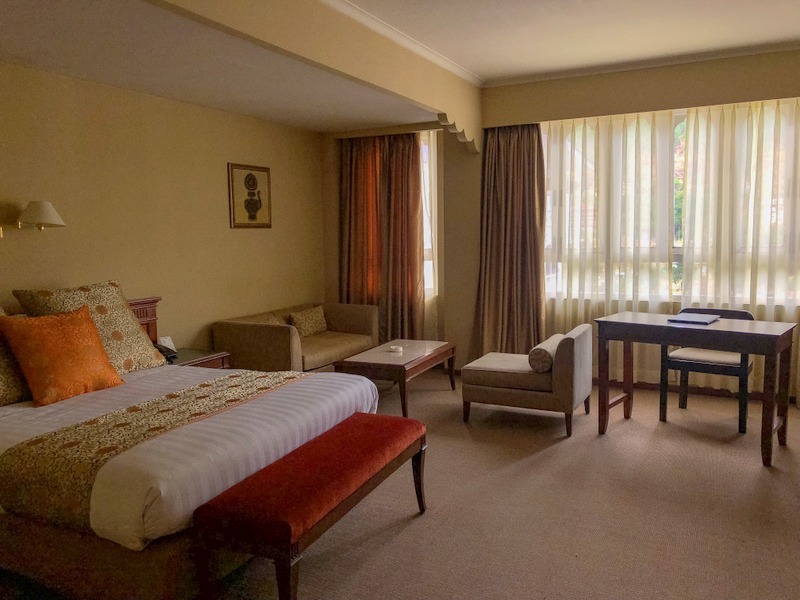 We stayed overnight in Thimphu, in the same hotel as the first two nights. Before we left Thimphu for Paro, we went to the Main Post Office. Why? Because you can buy regular stamps there with your own picture on it. At the Dochula pass we had already taken a picture , especially for these stamps. Here is the result. We have used them to send postcards to family and friends. 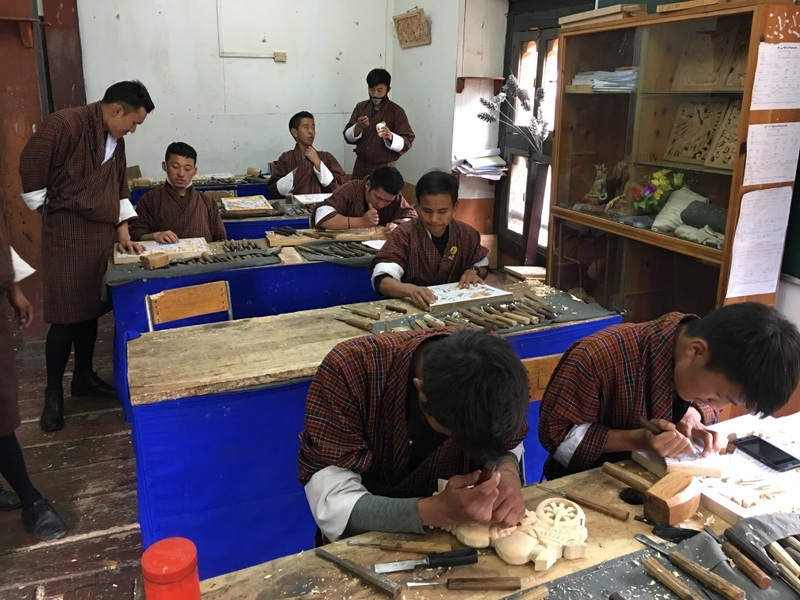 In Paro we first visited the National Museum, high above the Paro Dzong. 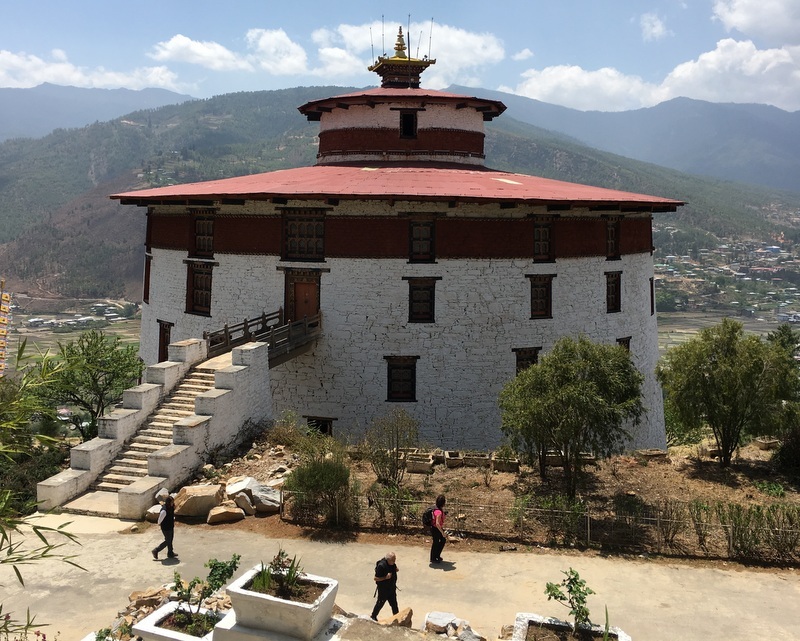 A watchtower (left) protects the dzong, which you can see downhill (right). 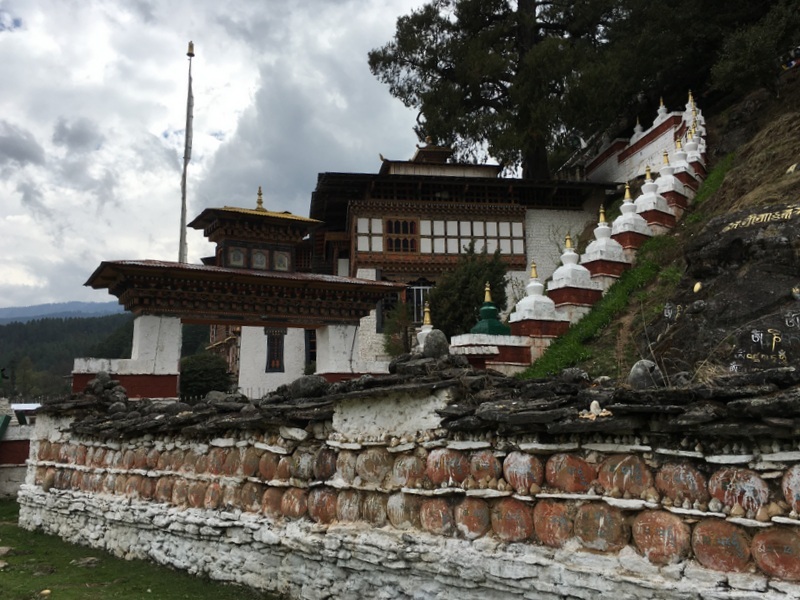 This was the fifth and last Dzong we visited during our trip. 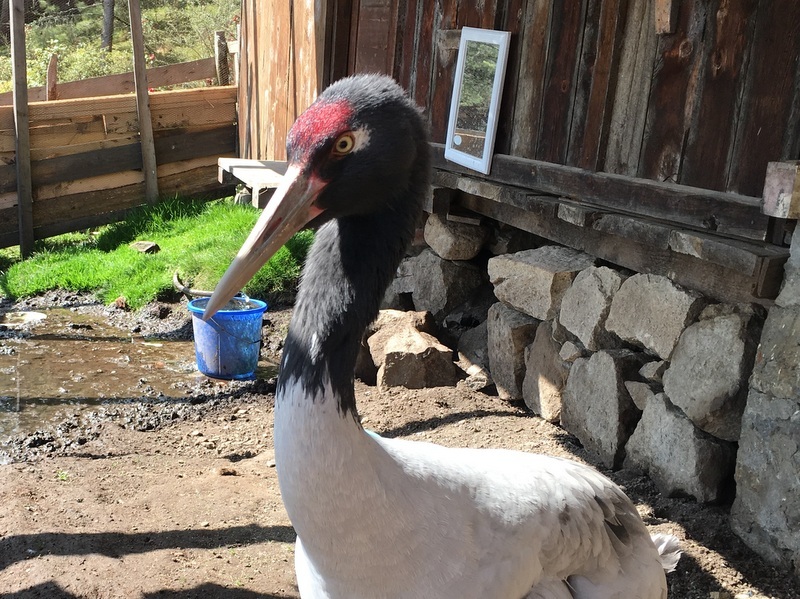 Fed up with dzongs? Not at all. Although the basic architecture is the same, all of them have their own character. And they are live monuments. 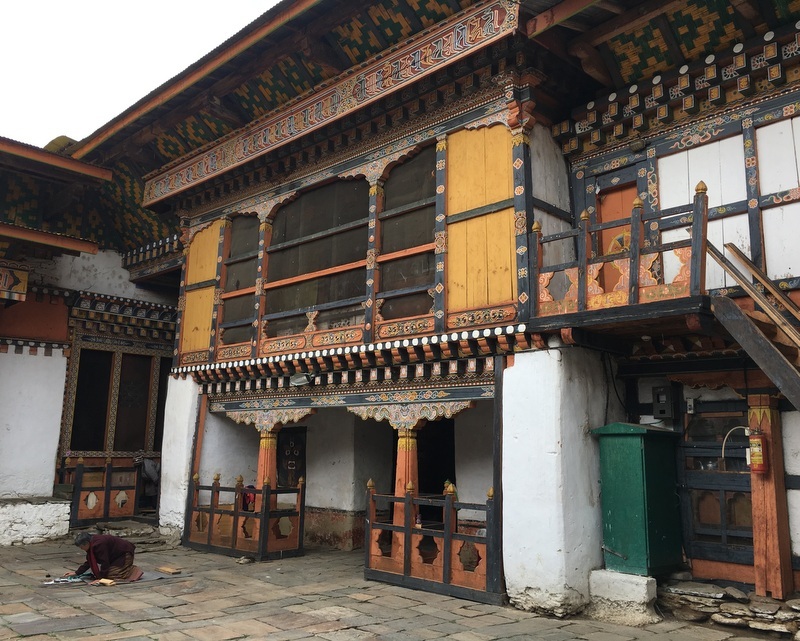 Here too the dzong houses both government offices and the monastic body. 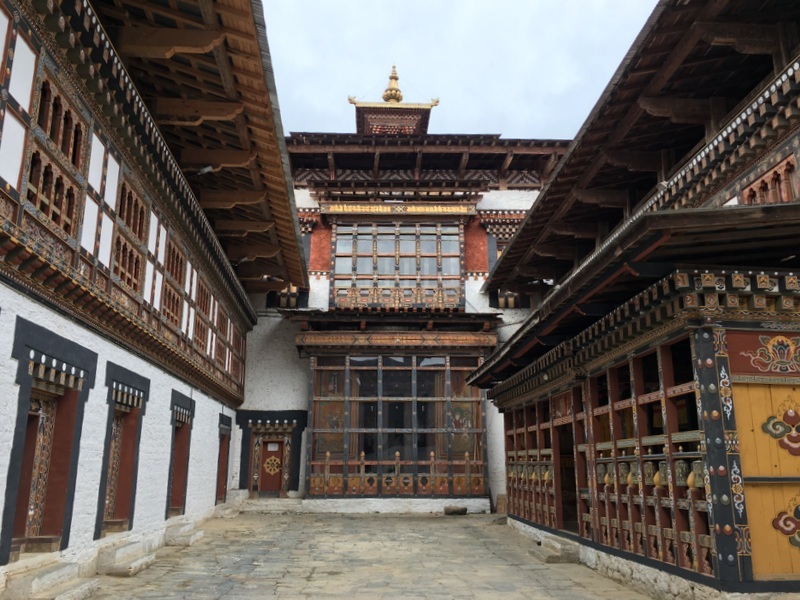 During our stay in Bumthang we had visited Jambay Lhakhang, one of the 108 temples, supposedly built on one day in 659 AD to pin down a demoness. 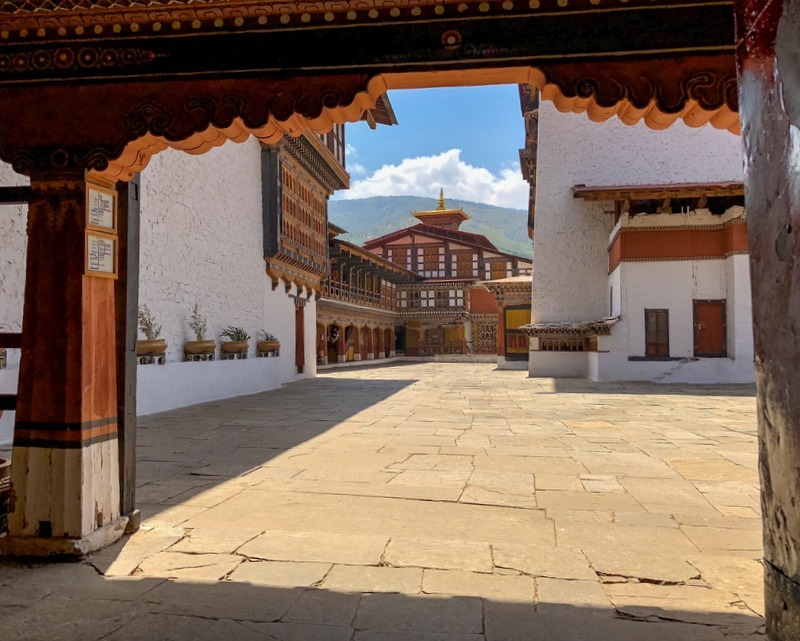 The other one in Bhutan is located in Paro, the Kyichu Lhakhang . 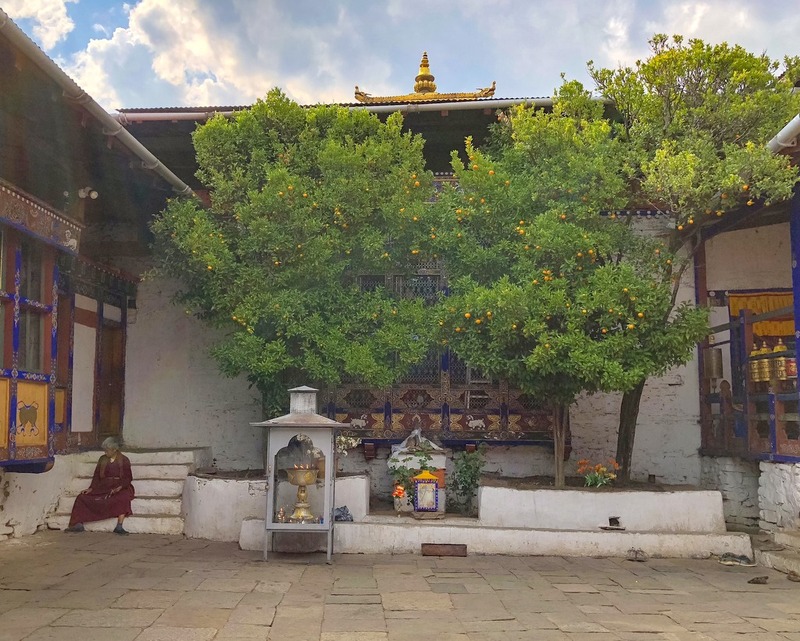 It is believed that the two orange trees in the courtyard of the monastery bear fruit throughout the year. 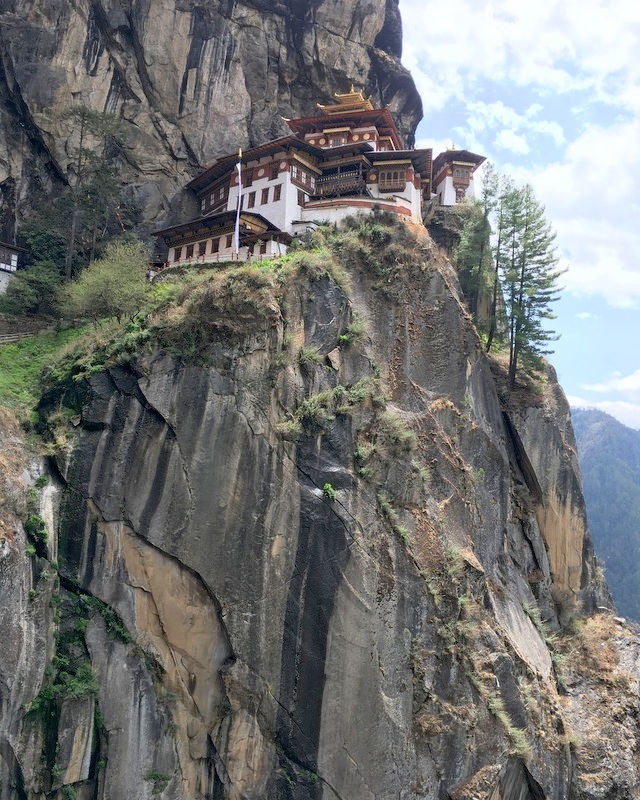 Probably the most famous landmark in Bhutan is the Paro Taktsang, better known as the Tiger’s Nest, a monastery located in the cliffside of the mountains near Paro, at an altitude of 3100 m. The shrine was first built in 1692 around a cave where according to legend the Guru Rimpoche had meditated in the 8th century. 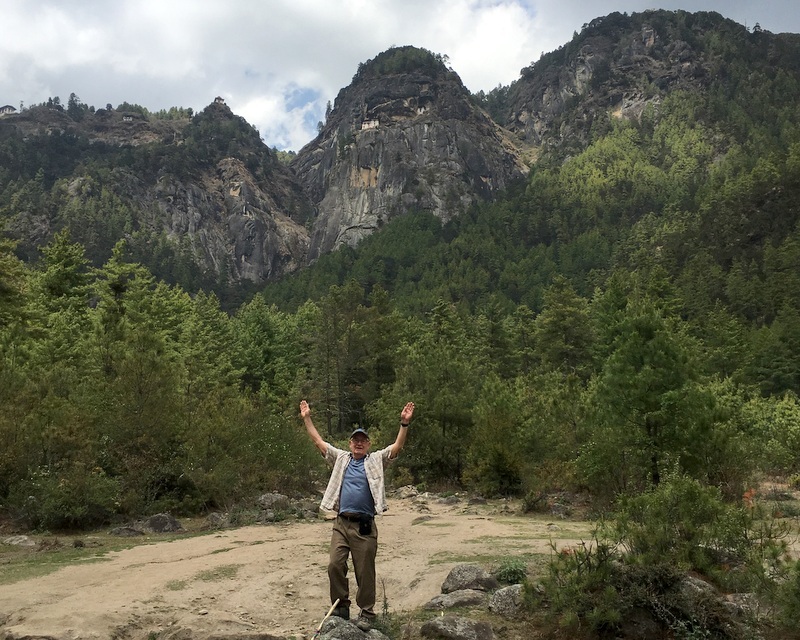 Even though we were reasonably fit, it was a tough hike, we were often out of breath because of the altitude. The pictures give the altitude and the time. Notice that we had to climb higher than the monastery, then go down steps about 100 meter and finally steep up again to the entrance. 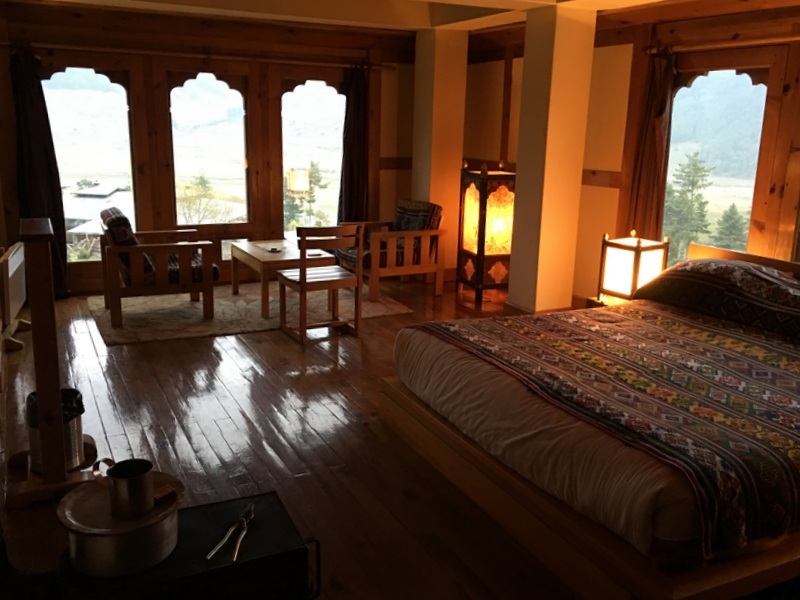 Aric had also asked them if they could arrange a Hot Stone Bath, a Bhutanese speciality. So, after lunch we went to a bathhouse. As they had to prepare the baths , we had some time to try archery. The water in the bathtub is heated by stones, that have been roasted in a fire. When they are dumped in the tub, they not only heat the water, but also give off minerals, supposedly good for your health. It was a fun experience, when the water cooled down, you just called the helper outside “one more stone, please”. 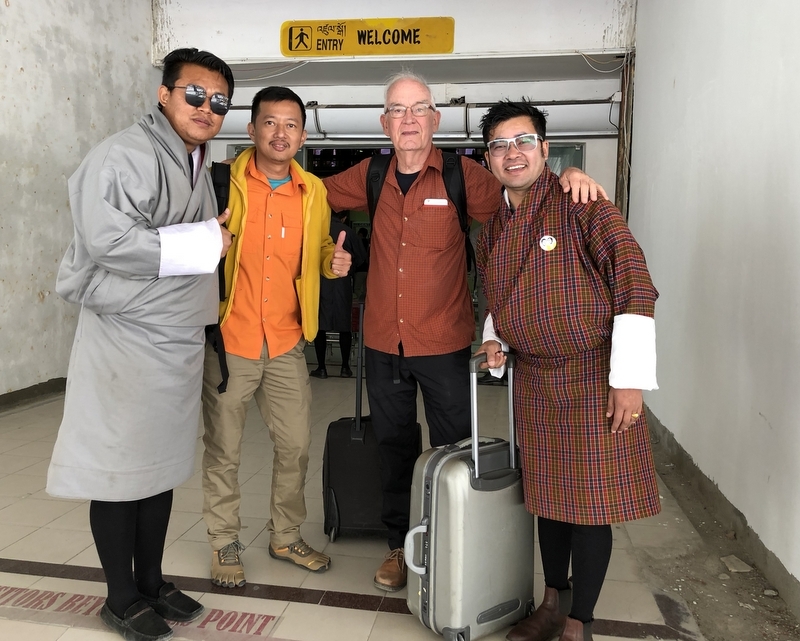 Ram and Tenzin took us to the airport, where we said goodbye to what had become our friends..